Every 2 years we hold a Tearle meet in England. This allows Tearle relatives to meet and get to know each other. Here we share impressions of the meets and what was shared at them. Jeffrey Parkhurst Tearle 1914, of Lebong, India, buried in Acroma, Libya. There was a feature poster of the Roll of Honour, as well as a large picture of the Menin Gate memorial and the Tyne Cot memorial, of Ypres. 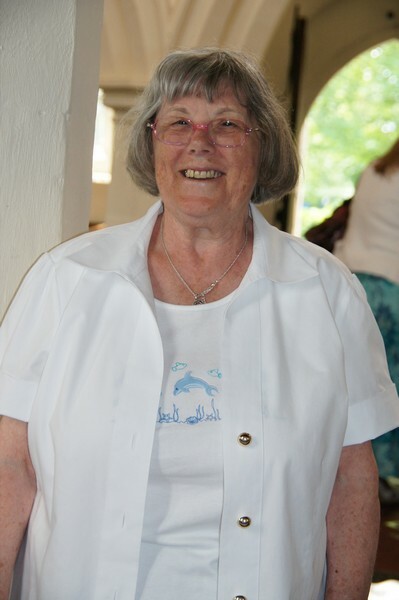 Can I please thank Pat Field for all her help with assisting visitors to find their connection to the Tearle Tree, and to John Field with his cups of tea and other refreshments. 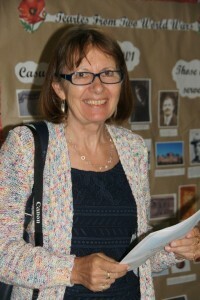 Thanks also to Barbara for manning the reception desk and taking the names of everyone who attended. We must also thank the 5 Bells for their delicious and perfectly timed lunch. They were very attentive and we were grateful for the respect we received when it was time for the speeches. 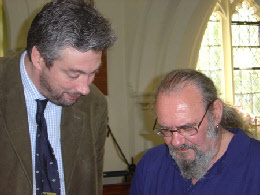 Thanks in abundance must surely go to Richard Tearle for his enthusiasm and counsel in the continuing story of the Tearle Meets. And I must also thank Elaine Tearle for her support for the Meets, looking after everyone on the day, cooking her famous shortbread, afghan biscuits and brandy balls and her generous energy in helping paste up the Tree. She has also accompanied me on lots of visits to Tearle sites. Without her, a great deal of this study would not have been possible. We would also like to record our thanks to the Vicar of St John the Baptist, Stanbridge, for allowing us to use her beautiful and historic little church for our Meet. 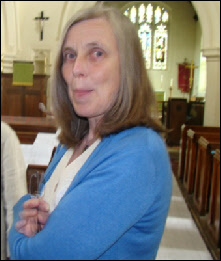 Revd Helen Gardner was unhesitating in giving her permission, and we are deeply grateful. 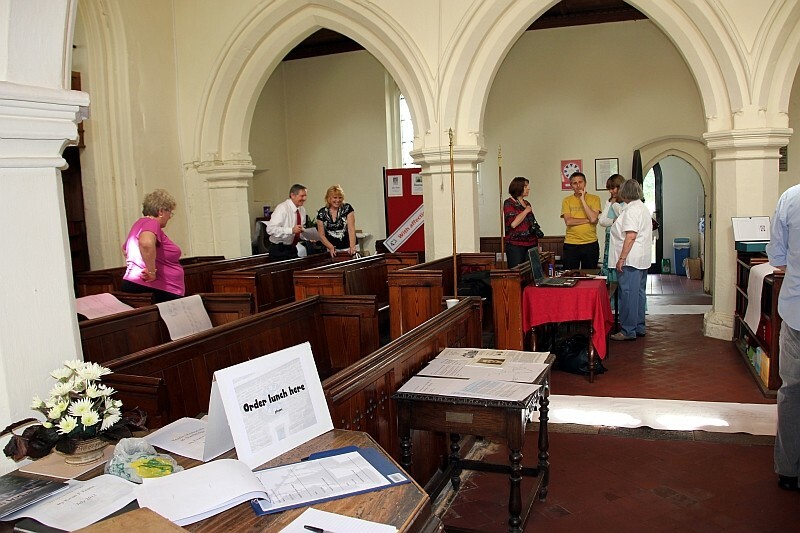 TearleMeet5 was held in the Stanbridge Church on 12 June 2014. It was focused on the World Wars because 2014 marked the 100th anniversary of the beginning of the most momentous event of the 20th Century – the Great War. It changed the world as it was known then – forever. Elaine and I had spent a weekend printing and pasting up the descendant trees of the common ancestors of most Tearles alive today. Joseph 1737 (340 pages) Thomas 1737 (591 pages) John 1741 (521 pages), William 1749 (340 pages) and Richard 1754 (340 pages) Nathaniel’s tree, which started with John 1620 (18 pages) and finally Ebenezer 1819 (8 pages). There was also the printing and pasting of the top of the Tearle tree from John 1560 to Thomas 1709 (4 pages) who was the father of Joseph, Thomas, John, William and Richard above. There are 16 generations of the Tearle Tree from John 1560 to my grandson. 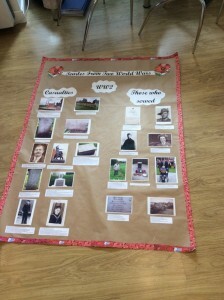 Richard Tearle, the leader of the Yahoo Tearle Group, and inspiration for the TearleMeets, had suggested the World Wars theme, so Elaine made up three huge posters – WW1, WW2 and the early 20th Century marriage of William Palmer (Bill) and Joan Orlo Todd in Wing. The two World War posters were divided into “Casualties” on the left of the poster and “Those who served” on the right. In the picture on the left, below, Elaine is examining the text of a caption prior to pasting it on the WW2 poster. On the floor to her left, you can see the tin of ANZAC biscuits that Elaine bought in New Zealand, to take to the TearleMeet. 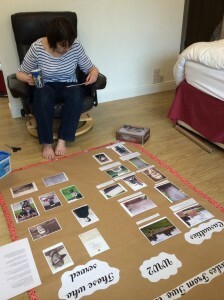 Elaine studies the stories of the people as she makes up the poster. 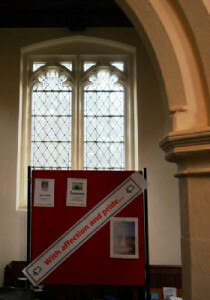 At the Meet, we had two large boards on which to display the posters, as well as the portrait of the wedding in Wing which we attached to the message board in the church entrance. Bryan Inns studies the WW1 poster. The Palmer wedding in Wing. 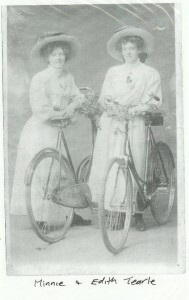 Jennie Pugh and Joyce Palmer feature. In the picture above right, you will see standing behind Ruth Palmer in a jaunty little hat, is our beloved Jennie Pugh, whom we have taken to two TearleMeets. Ruth Palmer was the daughter of Levi Tearle and Sarah nee Blake, and mother of the groom, William (Bill) Palmer, who is Levi’s grandson. On the right of the picture, standing behind two seated young women, is Jennie’s sister, Joyce Palmer, whom Elaine and I knew well, and have visited in London. 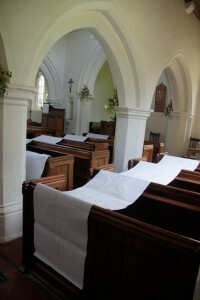 The shorter branches were draped over the pews. Once we had set up the registration centre, and the computer to access the family records, we rolled out all our printed branches. The branch of John 1741 (the one I am on) is the longest of them all. The branch of Joseph 1737 was next longest, and it did not fit anywhere because it, too, was very long. We laid it down in the next-longest isle, but we had to step over it to get to the kitchen. That’s the beauty of a small church – you fit it because you love it, and it will always accommodate you. The secret of the scrolls is that they are not very deep, only six generations, mostly stopping in the early 20th Century. They are long because the family has many members, so you have to read the scrolls from between the pews, and scan along the length of the scroll looking for the person in the family from whom you know you are descended. The computer helps there; I look up the person of interest on the family tree mapped out in great detail, and I can tell the person who initiated the enquiry, which scroll to study and approximately where to start. The reception desk with the registration book. Pat Field assists with enquiries. The reception desk allowed us to register each attendee, and to discover their Tearle roots. 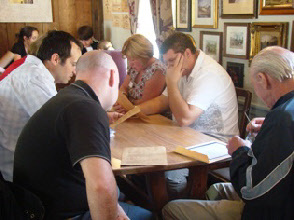 We took this opportunity to identify their ancestor, and to show them where, on any particular chart, they could start their research on how, and exactly where, their Tearle story started. We also displayed the pictures and story of family members who had died in the past year. Ewart, Catherine Brunton-Green and Barbara Tearle study Norman Tearle of Soulbury. The story of Norman Tearle, and his medals. Norman was killed in World War 2. He was on one of the Little Ships picking up soldiers from the beaches of Dunirk. He was killed on 31 May 1940, and the Little Ships rescue started on 24 May, so he might have sailed on a couple of rescue missions before his boat was destroyed. I cannot find any details of the boat or its story. He would have been Catherine’s uncle. Look at how young he was. 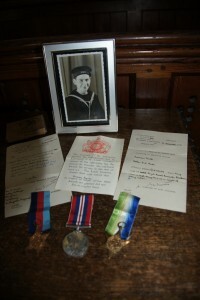 Catherine has made a dossier for his photograph, his medals, his letters and official correspondence about his death. She has kept his memory alive, that people may thank him for the contribution he made to a world he would never see. 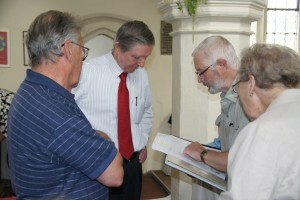 Ewart checks the paperwork with Alan Gibb. Minnie and Edith Tearle of Wing. Alan Gibb is an expert on the Wing Tearles. Levi Tearle, born 1850 in Stanbridge, left the village with his wife, Sarah, to set up a smithy of his own in Wing, about three miles distant. He also took his brother, Amos, who worked in the business until Levi’s second son, Mahlon, was old enough to become a blacksmith himself. This lovely photograph of two of Levi’s daughters (the third one, Ruth, is in the wedding photo, above) is an illustration of Levi’s love of mechanical things. Alan, above, brought documents and photographs to the Meet, to ensure that Amos’ family was well documented. We thank him sincerely. He gave us a photo of Jeffrey Tearle and Maud nee Cutler, his wife, and their children. Jeffrey and Maud’s grave in the Wing churchyard is within a few metres of the grave and headstone of Levi Tearle and many of his family. 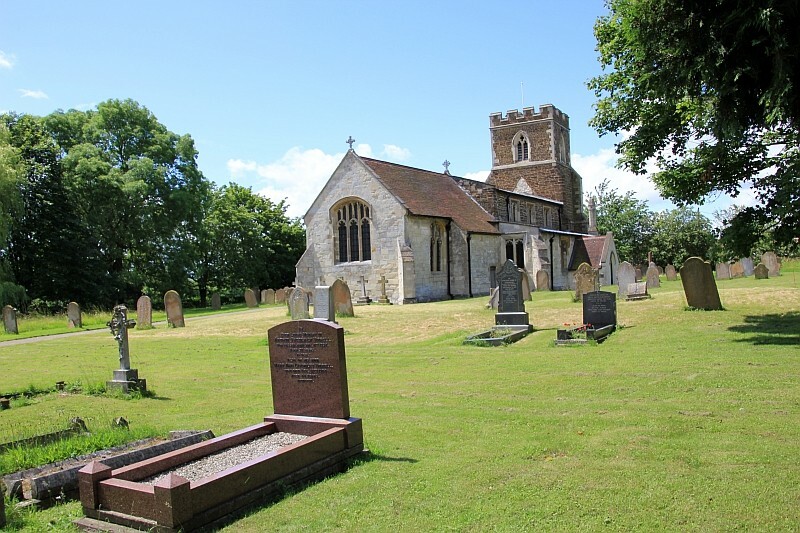 We have written a booklet on the Tearle graves that surround the church, and the relationships that even some non-Tearle headstones have with Tearle history in Stanbridge. This is a village that has existed since at least Roman times, and its story since the Normans is largely, although in a fragmented way, documented. The church itself is a Norman church, built on the site of an existing chapel. Outside the door of the church is a stone which has been deeply carved with what would appear to be a Celtic cross, which hints that this has been a holy place for very long time. The Tearle graves are an important part of the documentation of that story. Village lives are complicated by time and by changing relationships. The Tearles were mostly tenant farmers and farm labourers; their marriages were amongst the other tenant farming families, and those of neighbouring villages. They also followed the religious streams of their times, so there is a strong Methodist following in Stanbridge, and the booklet documents those lives as well. 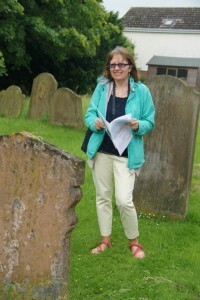 Karen Davies explores the Methodist graves. 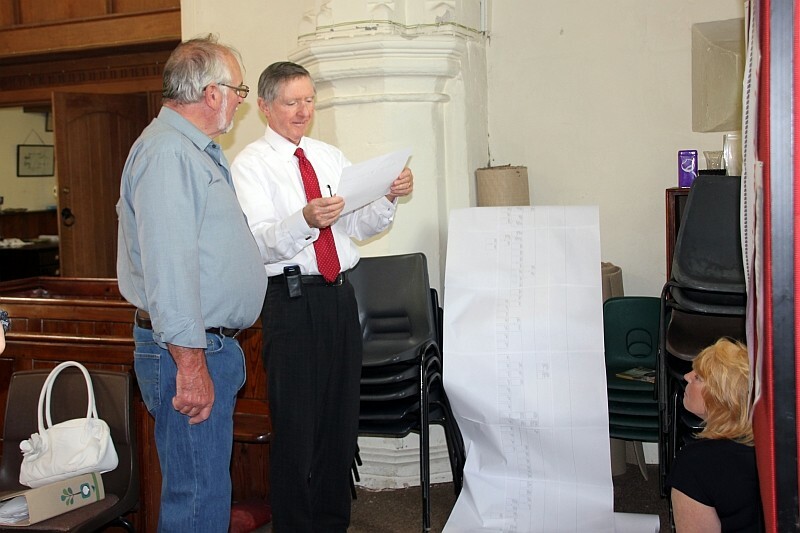 Rod Teale reads some of the Methodist headstones. 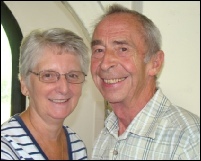 Karen and Rod, above are descended from Methodist families of Stanbridge. The booklet documents the relationships between the names on the headstones, often revealing the complex relationships that village life developed over time. Karen for instance, is the great-great-grandaughter of Phoebe Tearle, born 1843, who married Jason Field. It can be a salutory experience to come from London or Lincolnshire and see the tiny village, the lovely church, the powerful headstones and note the lives of children who died tragically young, to become aware of a past that we have inherited, if only we knew its story. Karen added to our knowledge by gifting us a photo of Phoebe Field, her daughter Mary Sharrod (she married Michael Sharrod in London) and Edith Mary Sharrod (Mary Sharrod’s sister-in law) who had married William Henry Bocock in Nueaton, 1909. She also gave us two pages of her family register one of which recorded the children, and another the deaths, of Mary and Michael Sharrod, who, interestingly, became Baptists. I did say village life was complicated. 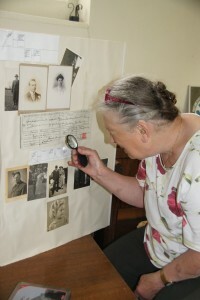 Enid Horton studies some of the documents. Ewart with Sheila Mould and Geni. 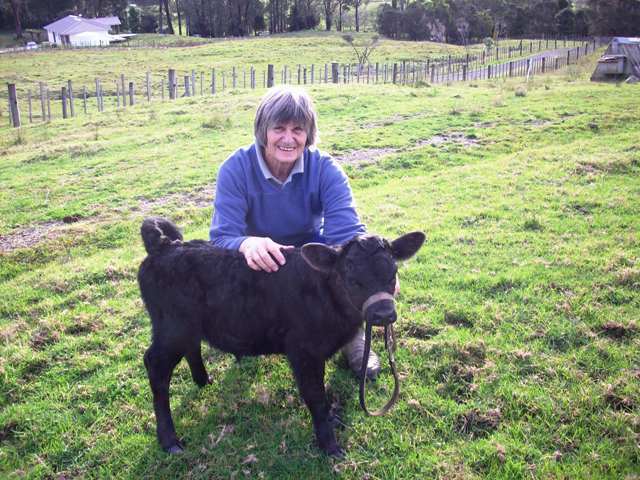 Enid Horton is a TearleMeet regular and brings a wealth of knowledge of her Tearle roots. 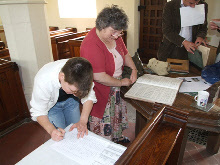 Enid and her daughter Lorinda, in the very first TearleMeet, transcribed all the Tearle marriages from the Church’s banns register since 1823. I should point out, too, that Enid Horton is descended from Annie Tearle 1868 and Charles Rose. Annie was a daughter of John Tearle and Maria nee Bliss. His is the headstone, that records he was the church sexton for 60 years, is alongside the headstone of my own great-great-grandparents, James Tearle 1827 and Mary nee Andrews. John and Maria’s youngest son, and therefore Annie’s brother, Arthur Tearle 1881, emigrated to America. His modern descendants are the Chancellor boys, Bob and Sam, of Missouri. They still have contacts with the descendants of Charles Rose, in Stanbridge. Sheila Mould, above, came to give us some depth into the story of her family. She is descended from George Tearle b1818, the first Tearle to move from Stanbridge to settle and work in Watford. On the railways, of course, one of the cornerstone forces of social change in Britain in the 19th Century. 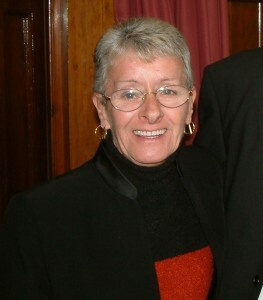 Sheila is also a cousin of many Australian Tearles, also descended from Watford Tearle families. 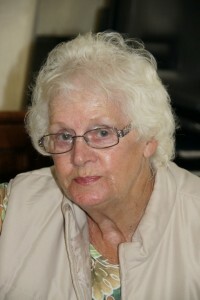 Sheila Leng, a Bedfordshire local. There are more Tearles in the phone books of Leighton Buzzard, Dunstable and Luton than anywhere else in the world. Sheila comes from that select group. She has been to every TearleMeet, and she is a close cousin. Steve and Alison Wheeler dropped in to wish us all the best and to drop off a few stories of their family history. Steve is descended from Emma Tearle 1837, who married George Pratt in 1857. Theirs is one of the marriages Enid Horton and Lorinda found in the banns register. Emma is a sister to James 1827 and John Tearle above, and therefore Steve is related to Enid Horton, to me, to Sheila Leng, and to the Chancellor brothers. 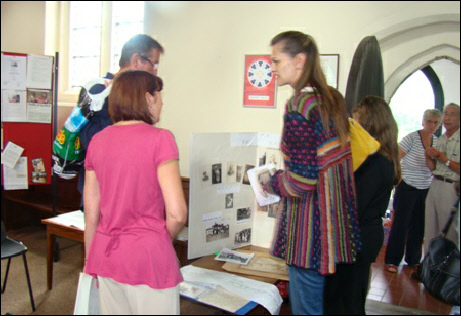 Deborah Meanley examines the Soulbury Tearle exhibit. A visitor arrives to tell her story, and to explore the scrolls. 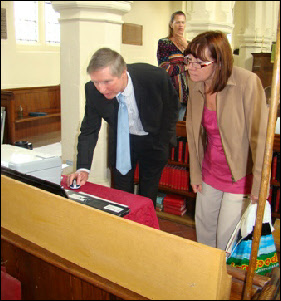 The visitor above, paperwork in hand, came to see how her Tearle connections fitted into Tearle history. 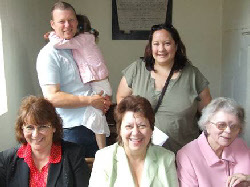 Deborah, above right, is descended from the Soulbury Tearles. Norman Tearle was one of those, but also Edward Kefford Tearle, who was killed on the same day as Norman. Whilst Norman was rescuing soldiers from the surf of Dunkirk, Edward was fighting a rearguard action to keep the Germans at bay on the inland side of the coast. 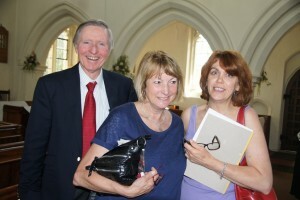 Barbara Tearle, Samantha, and Richard Tearle. 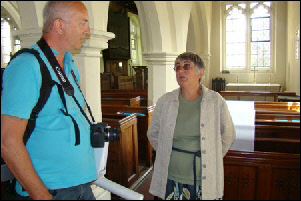 Barbara Tearle is possibly the most knowledgeable person around on early Tearle history, and a truly nice person. We are fortunate, and privileged, to have her as a TearleMeet regular, and our mentor. 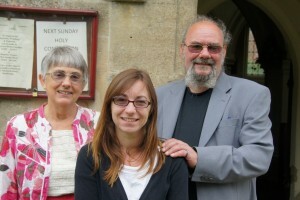 She is the sister of our Tearle Group leader, Richard Tearle, and they are standing with Richard’s daughter, Samantha. Stephanie and Rod Teale came to our last TearleMeet and for them it was a revelation. They were not Teales at all; Rod Teale was a dyed-in-the-wool Bedfordshire Tearle. It was a delight to see them return. We noted with great sadness the passing of three Tearle family members: here are the obituaries I prepared and read to the TearleMeet. As you walked into the Stanbridge Church today, you will have seen the sepia print of the wedding of William (Bill) Palmer and Joan Todd, which forms the backdrop to the welcome poster for this Meet. I know both Bill’s children, and their families. 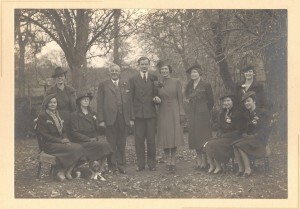 The seated woman in glasses is Bill’s mother, Ruth Palmer, nee Tearle, the sister of my grandfather, Arthur Tearle, of Wing. Their brother was Mahlon Tearle, the grandfather of Rachel Smith nee Tearle, also of Wing. Ruth, Arthur and Mahlon were some of the children known locally as the Tribe of Levi. To the right and behind Ruth Palmer is Jennie Palmer, whom almost everyone here will have met at the two Meets she attended. You will have known her as Jennie Pugh. If you now look all the way to your right of the photo, you will see standing Joyce Palmer, with the happy smile and the perky hat. She, Jennie and Bill were sisters and brother. When Elaine and I came to England in 1999, there were six people of her generation still alive, including my father. It is most sad that all the accumulated knowledge, wisdom and experience of that generation is now gone. When she died in September 2013, Joyce was the last. What was she like? She was perfectly straight, honest, kind, forthright to a fault, and she loved her family and was highly knowledgeable in family matters. She was also very deaf, although she could hold a conversation, and could certainly hold her own. She lived in Du Cane Court in Balham, a towering and handsome Art Deco building, said to be the largest brick building in Europe. She was extremely well looked after there, and the porters and maids all knew her by name, and cared for her closely. The photo I have supplied I took of her on her 90th birthday, and she said it was the first time anyone had bought her champagne. She travelled by train all the way from Balham to Leagrave at least a dozen times to meet me there and to visit Jennie Pugh while she was in the care home. Joyce was determined, city-savvy and courageous. She would walk through four lanes of traffic (she was deaf, remember) to cross the Balham High Street when she wanted to catch a bus, or take the Underground; and she never used the lights. I admired her. She was stalwart, kind, thoughtful and a singular woman of immense fortitude. 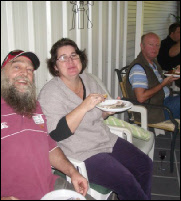 Ray Reece and Denice at the Brisbane Meet. It is with much sadness that we have to inform the Meet of the death of Ray Reese. Many will remember his huge goodwill and his depth of kindness and humanity. He was always ready with a quiet and considered word, as well as a prayer, full of generosity and gentle supplication. He was a quintessential Australian, perhaps even the quintessential Australian, who was witty and full of life as well as immensely proud of his Australian origins, and his Australian lifestyle. When Elaine and I went to Queensland to meet many of the Tearles who live there, he showed us his neighbourhood, and the kind of houses they build there, called Queenslanders and designed, he said, more by the environment than by human will; and then he and Denice took us on a memorable tour of the Gold Coast. He was a member of the Tearle family due to his marriage to Denice nee Tearle, who is the daughter of Harry Leslie Vernon Tearle, a WW2 survivor, who enlisted in Brisbane and served in the Australian Army as number 76049. Her grandparents were James Henry Tearle of Tebworth and Edith Lydia Morgan who were members of a family of straw hat manufacturers in Dunstable. They left for Melbourne in the very early 1900s but James still signed up for the Australian army to fight in WW1 as number 2464. He, too, was a survivor. Denice was delighted when Elaine and I took her, and Ray, through Tebworth, past the Methodist Chapel, and then to Chalgrave Church. She was so deeply moved to be in the home of her grandfather, she was close to tears. In that beautiful little church, the timbre of Ray’s voice and the humility of his gentle, quiet prayer developed into a moment of deep contemplation. He was a man you couldn’t help but admire. Denice’s great-grandparents were George 1851 of Hockliffe, and Louisa nee Finch, so you can see, Ray and Denice’s connections to Tearle Valley are strong and their commitment to meeting their family in this valley can be seen by the fact that they have travelled here twice to join us, and each time their warmth and inclusiveness have been a highlight. I am delighted to say that I have met Ray and Denice in England and in Australia, and on all occasions they have enriched our lives. We mourn the death of Ray Reese, and we wish only the very best for his dear Denice. Rachel Smith nee Tearle, who was Thelma’s sister. 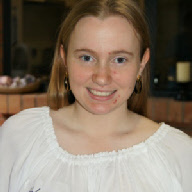 We have to record the sad loss of Rachel in March this year after a very long, gallant fight with cancer. I saw her last in 2009 when we took a trip on the Leighton Buzzard light railway, the train being driven by Martin Shepherd, her nephew, on the occasion of his 40th birthday. Rachel told us of her impending operations, and the entire process was very serious. She was a sparkling, intelligent lady who once lived in one of the cottages owned by Levi Tearle in Wing, close by the Handpost, which these days is a small roundabout rather than an intersection. She was the daughter of Harry Mahlon Tearle and Millie nee Green, who was most famous for being a very long-serving AVON lady, and a beauty in her own right. You have already heard of her sister Thelma, but she was also brought up with her brothers Alec and Dennis, in one of the tiny Ebenezer Cottages abutting the Big House (as they called it) which my great-grandfather Levi Tearle built in Wing. Her grandparents were Mahlon Tearle of Wing, the brother of my own grandfather, and Mary nee Paxton. And, of course, as I have hinted, our common great-grandparents were Levi Tearle 1850 of Stanbridge and Sarah nee Blake. For many years Rachel lived for six months in England and six months in Majorca, where she worked as an estate agent. We never knew her well, because we met her only seldom; but we know we are fortunate because we knew her at all. We are very sad to see her go. 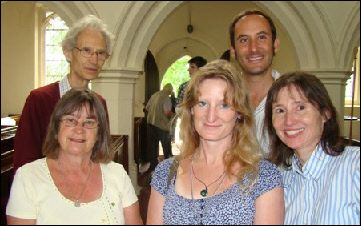 The first Tearle meet (inspired by a suggestion from Barbara Tearle) was held at St John the Baptist Church, Stanbridge, Bedfordshire, on 8 July 2006. I hoped about two dozen would attend and we welcomed 50. It was actually a really good number because many people were able to talk to each other and it was a comfortable number to fit in the church. We had people from a very wide area – Rugby, Warwick, Wales, Brighton – so people certainly gave a lot of their time to attend. Many people also brought documents and Jennie Pugh brought some artifacts from my great-grandfather Levi’s smithy in Wing. As everyone arrived, we gave them a copy of the Tearle Memorials in Stanbridge pamphlet. 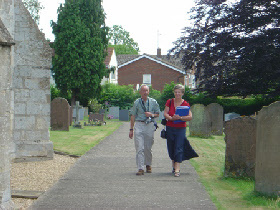 Here are John and Pat Field, pamphlet in hand, scouting the memorials. And here’s an idea, below, of just how big the Tree is when printed and glued. 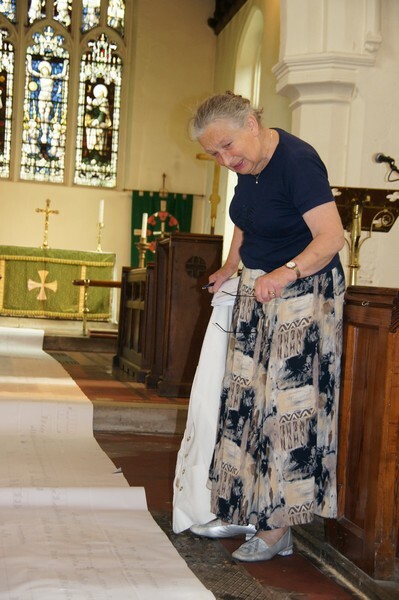 We were very fortunate to have Enid Horton and her daughter Lorinda, below, who volunteered to examine the banns register and transcribe all the Tearle events therein. 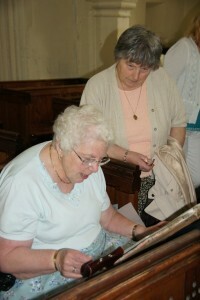 Enid Horton and her daughter Lorinda working on the banns register. We had a visit from the Dagnall Tearles, above, and they lingered long over the John 1741 branch, then went off to Edlesborough to see the memorials there. An engaging group. Front left, Elaine Tearle of Dagnall. Jo Smith and her daughter Tracy. A group of us went on an expedition to Wing. Here we are at the cricket grounds inspecting the fencing and the gate that Levi built. I’m the one kneeling. The manager of Ascott House said they might call it Tearle’s Gate. Front: John and Ewart Tearle and Ingrid Taylor. 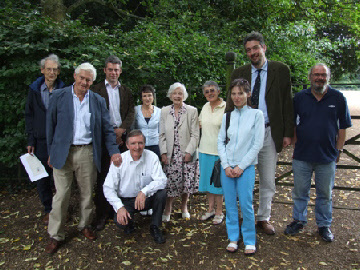 Behind: David Ashley, Sam Tearle, Barbara Ashley, Jennie Pugh and Barbara Tearle, James and Richard Tearle. A copy of the typed version of the Bishop’s Transcripts had been given to the church and Rev Janet Spicer left it for us to refer to. 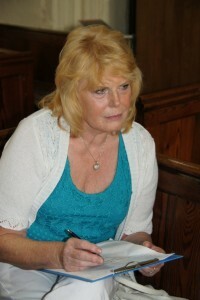 Barbara Tearle, below, is Richard’s sister and a world expert on the Tearles. 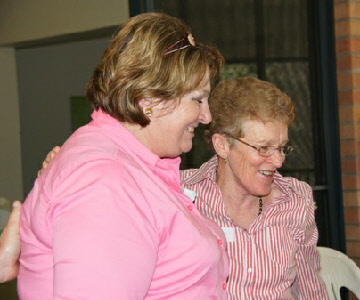 Here she is on the left, meeting one of the visitors with Elaine in the background talking with Lorinda. One of the highlights was a visit by a family who hadn’t seen each other for quite a while. 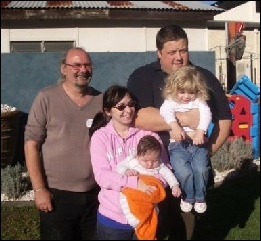 Descendants of Mahlon, second son of Levi Tearle of Wing, are John Tearle in the centre, brother to Sheila, while James and Sam are his sons. 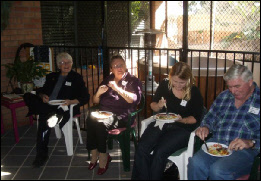 Jennie Pugh, centre, is their aunt, a grand-daughter to Levi. 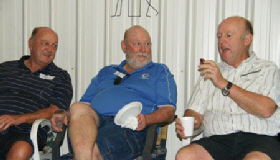 John Tearle in the centre, brother to Sheila, while James and Sam are his sons. Jennie Pugh, centre, is their aunt, a grand-daughter to Levi Tearle, blacksmith of Wing. A fabulous day that began 24 hours earlier. I travelled down from Lichfield on Friday 7th having booked a room for an overnight stay. The journey was thankfully uneventful and I managed to take in an hour or so in Leighton Buzzard, spending much of that time walking around the graveyard of All Saints Church and then enjoying a much needed mug of coffee in their small cafe. Then I took the bus to Dunstable, trying to take in every inch of the route. we came upon Stanbridge almost without warning. Suddenly there was a magnificent sign for the 5 Bells and my first fleeting impression was that this was one of the biggest pubs I had ever seen! I barely had time for that thought to register before we were passing the Church of St John the Baptist. And what a beautiful church it looked too. Atop a slight hill and with gravestones on all sides it looked the very epitome of a country church. The bus moved on through Tilsworth and soon we were moving out of the main area we call Tearle Valley: but the signposts all bore familiar names; Houghton Regis, Eggington, Edlesborough, Eaton Bray. I couldn’t help imagining my ancestors walking along these ways or working, perhaps, in some of the fields that flashed by on either side. On arrival in Dunstable I sought out my accommodation: a little further out than I had imagined, but the Tearle antenna found it without difficulty. I booked in, time to freshen up, unpack, take a rest and appraise the brilliance of Federer and the immense potential of Nadal and then it was out for a pre-arranged dinner appointment with Barbara. Time flew by before we realised that we had spent close on 3 hours indulging in excellent Italian cuisine and recalling family stories, childhood memories and the idiosyncrasies of various relatives from both sides of the family. By the time I got back it was gone eleven o clock and logs could learn a thing or two from me about sleeping! The sun shone and there was a bit of a breeze which meant that temperatures did not feel too high. Barbara met me where I was staying and within a few minutes Jo and Tracy arrived to pick us up, as had been arranged. Tracy took us through the country side while Jo gave as a fascinating running commentary – neither of us had really been in these parts before. We arrived at the Church bang-on 10.00 and there were already half a dozen or so cars parked on the grass verge. The first people we met were Pat and John as they arrived at exactly the same time. Ewart was waiting for us all at the entrance to the church, already surrounded by half a dozen earlier arrivals. Ewart then proceeded to hand out the pamphlets he had made up about the Tearle memorials in the graveyard and we set our stuff out on tables for people to look at. Meanwhile, people were pouring into the church – and I am not exaggerating! – and introductions were flying around left, right and centre. It was heartening and, as Ewart later put it, humbling, to hear the words “I’m not a Tearle but read about today in the Parish Magazine and thought I’d come along as I used to live in the village.” This occurred on a number of occasions. At one stage I counted over 40 people in the church and expectations were exceeded! Elaine arrived with print outs of the tree and these were laid out on the floor. At times it was impossible to get to them because of the number of people interested. There were a number of old photographs of various family members and one item that was always popular was the Scrapbook that Jo had compiled about old Dunstable. I am hoping that someone who has a better memory than me can post an account naming people who were there, because I will miss out many and I apologise to them for that. To give you an idea of how successful it was, Elaine had to go to the 5 Bells to warn them that nearly three times as many people as had been notified to them were intending having lunch there! All too soon 12:00 arrived and we had to vacate the church. CDs that Ewart had brought along were sold and the money donated to the church. And then most of us repaired to the 5 Bells. Lunch was a wonderful, relaxed affair. It was very gratifying to see people who had never met before chatting away and making notes of telephone numbers or e-mail addresses. A word should be said about the staff of the 5 Bells: faced with an influx of some 25 Tearles, they organised things magnificently and were friendly and helpful throughout. Ewart made a short speech, followed by an even shorter one by myself and the day began to wind up, but there was one more treat for some of us. Ewart had arranged that we visit Wing and look at some of the things relating to Levi the Blacksmith. We saw the iron railings and gate that surround the cricket ground at Ascott House and our thanks go to Patrick, the Estate Manager who allowed us to do this, accompanied us and gave us some insight into the stories behind the Rothschilds and life in those times. Then we went to Wing and looked at Levi’s cottages and the where the smithy had stood. Ewart took us to the Church and we saw Levi’s headstone. At this point, I had to leave and I must thank Elaine for taking the time out to drive me to Leighton Buzzard station. Special mention must be made of Jennie, Levi’s granddaughter, who was with us the whole day. At 91, I hope I am that sprightly and compos mentis when I get there! 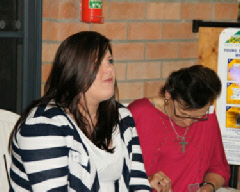 She told some wonderful stories of Levi and was clearly moved by the whole event. I would like to nominate Jennie as Guest of Honour and her presence brightened an already brilliant day! To sum up, then: an unqualified success of great value to all who were there and, I hope, an inspiration to all members. My personal thanks go to Ewart and Elaine whose organisational skills are second to none and to all those who turned up and made it the success it undoubtedly was. I have just read Richards account of his day at the meeting, from start to finish, he obviously absorbed every moment from the time he arrived in Leighton Buzzard to the time he got back on the train to Litchfield & it was lovely to read his memories of the day. I have to say that it was a truly lovely 4 hours for myself & Tracy. Tracy came along but thought she might be bored with all this family chat, but found she enjoyed herself. We were sorry we had to leave early as we would have liked to have gone to Wing, but Tracy had to get back to relieve her partner of the joys of looking after two very energetic boys, one being 3 1/2 & the other nearly two. I was also pleased to see so many people in the church & also the people who weren’t related but just wanted to join in with us. I would like also to thank Richard, for making the day possible through his web site & to Ewart & Elaine for bringing along the now huge family tree, the CD’s & memorial information. It was also good of the Rev to set out the parish records for us to see. Hopefully this meeting will be one of many, & we can get to know each other better, but like Richard said we will have to discuss that & see how the membership numbers go. I had the pleasure of sitting next to Jennie in the Restaurant & when she proudly announced to Tracy & I that she was 91 we found it hard to believe as she looks years younger, & she is an inspiration to us all, a very lovely lady. The Tearle family get together, announced in the last issue of the journal, took place on one of those idyllic summer days of sunshine, warmth, and gentle breezes. It was successful beyond the wildest dreams of the organisers. They would have counted it a winner with a dozen people, so they were overwhelmed to find that it had attracted about forty. The day could not be called a Tearle reunion as we had not met before and in fact only a few people had ever met any of the others. The day was organise by Ewart Tearle, a New Zealander now living in St Albans. 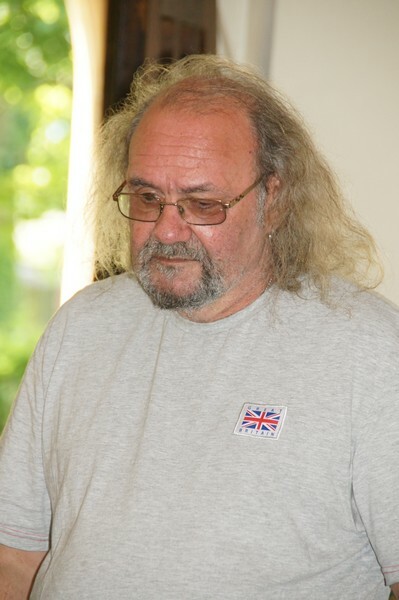 It developed naturally from his contribution to the Tearle webgroup run by Richard Tearle. Ewart has been entering everyone’s individual family research on a giant Tearle family tree and touring the area of “Tearle valley” photographing gravestones and the churches of our ancestors, so the obvious next step was to gather the living Tearles together so that we could meet each other. The TearleMeet attracted Tearles from the south coast and the Midlands as well as from the Leighton Buzzard, Luton and Dunstable area. 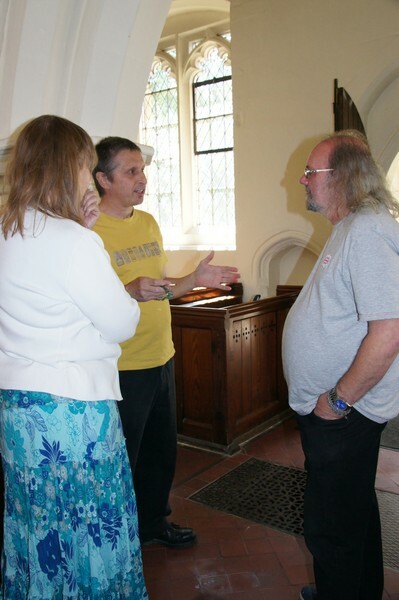 We met for two hours in Stanbridge church by kind permission of the vicar, who had announced the event in the parish magazine with our invitation to any parishioners who might be interested – and they were! Several Stanbridge ladies told us about the last Tearles in the village, two sisters who were there in the early part of the 20th century. Their deaths ended the family’s association with the village which goes back to 1470 and possibly earlier. 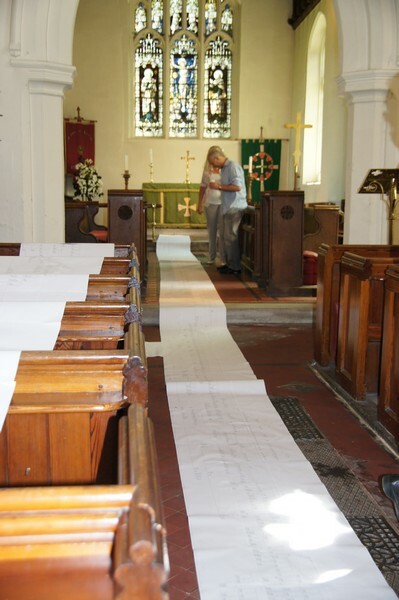 Ewart’s wife Elaine spread the family tree – made up of 60 or more A4 sheets of paper stuck together – along one of the side aisles. Several people brought scrapbooks and photographs. Ewart brought a yoke and a piece of ironwork made by Levi Tearle, a blacksmith in Wing in the late 19th century. Throughout the morning, people were crawling over the tree working out were they were – or rather where their ancestors were because it contains no-one born after 1917. I failed miserably to find Zephaniah Tearle (b. 1868) for one lady who wanted to know where he fitted in, only to be told by Ewart that he was not on the tree as it is not yet clear who his parents were. I had more success tracing the ancestors of the actor Tearles, Sir Godfrey, his brother Malcolm and half brother Conway Tearle, who was not a Tearle at all. Someone else remembered the son of Trelawney Tearle, from the era of the First World War. Lest anyone think that all Tearles have unusual names, most are John, Thomas, Robert, William, George, Jane, Sarah, Mary and Elizabeth, so the different ones stand out as welcome points of reference. Two hours passed very quickly amidst crawling on the floor, looking at photographs, finding the Tearle graves in the churchyard and the memorial in the church (to the Tearle wife of a Methodist missionary to Africa, both of whom died within months of leaving England) and meeting other people. Many introductions began with the phrase “I’m from the Eaton Bray branch” or the Totternhoe or Luton or Wing branch, meaning that their ancestors moved there from Stanbridge during the 19th century. But no-one was from my branch, the Toddington Tearles. At noon, we crossed the green to the Five Bells who had been warned during the morning of a group of 25 for lunch. They set aside one end of the restaurant for us to continue chatting and served food and drink with great speed. Several of us spent the afternoon in Wing viewing the places connected with the blacksmith Levi Tearle, in the company of a delightful lady who admitted to being 91 and remembered living in his house or one of the cottages he built. We were also taken on the Ascott estate to see the iron gate and railings which Levi made and which surround the cricket pitch. The day brought home to me some of the geographical and social conditions of our Tearle ancestors. For centuries all but a handful of escapees lived in an area radiating for no more than about five or six miles from Stanbridge – but maybe that is the subject of another article. We all enjoyed the day and hope to repeat it in two years time. It would not have been possible without Ewart’s immense work and enthusiasm and the goodwill of the vicar. 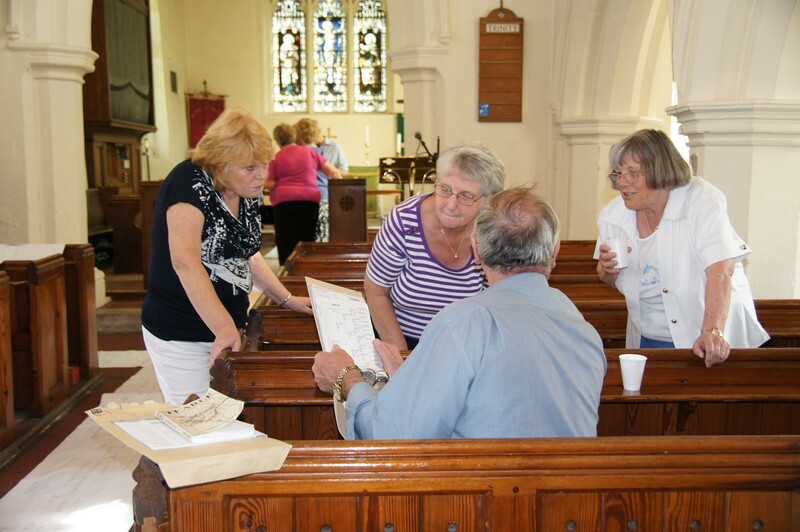 The moral of the event for family historian is that an impromptu, low key, gathering is relatively easy to organise and brings a new interest to family history. Held in Stanbridge on Sat 5 July 2008. The highlight of the whole day has to be the huge distances people had come to be there. We had families from Australia and Canada, Rugby and Southampton – and everywhere in between. 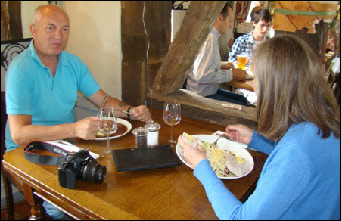 When we set off to the 5 Bells pub in Stanbridge for lunch, we had 50. Here are the Canadians – mother Sheila Rodaway (on right of the picture) and daughters Sharon Mallette and Diane Hill. Incredibly, they were on the Thomas 1737 branch and as descendants of Jabez, they were closely related to John L Tearle the author. The Canadians – Sharon Mallette, Diane Hill and Sheila Rodaway. Somehow a TearleMeet is not complete without Jennie Pugh, but today’s Meet was extra special for her, because it marked the reunion of the Wing Tearles. Jennie is descended from Levi, the blacksmith of Wing and Alan Gibbs is descended from his brother Amos. For many years, Amos was the blacksmith’s assistant. Jennie and Alan swapped stories and memories of Wing for a long time. 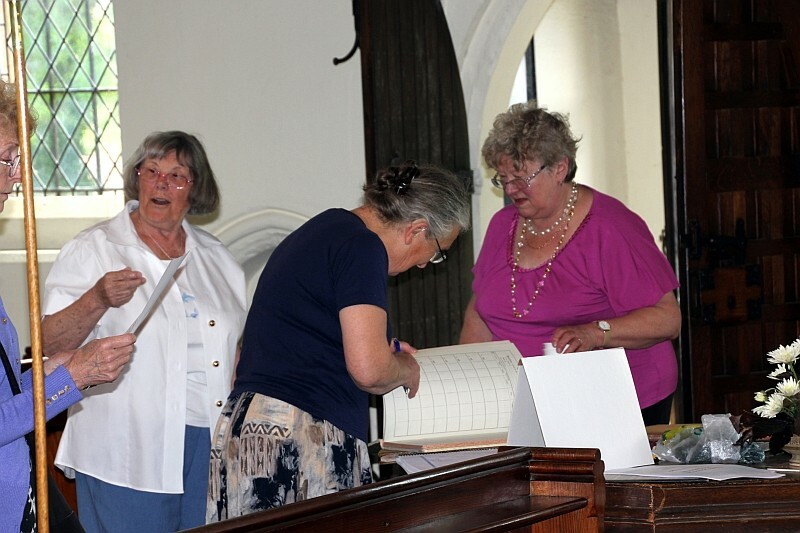 We had a little attendance book and Barbara volunteered to be hostess and ensure everyone signed it. Here she is overseeing brother Richard while he does the honours. Elaine had brought Jennie Pugh from Luton and she is lining up to sign as well. Here is half the Australian attendance on the day. Helen Manning nee Tearle and family are examining the John 1741 branch to see from where on the branch they descend. A charming family, they involved themselves fully all day in the ongoing activities. 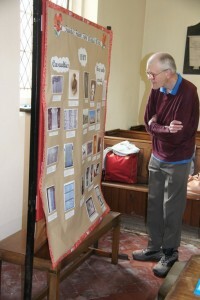 Lawrence Cooper, an ex-villager and still an owner of ancient Stanbridge land, gave us a presentation on Victorian Stanbridge using his collection of postcards and photos. 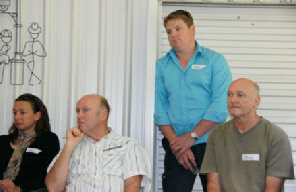 In the picture are Helen Manning, Susan and Allan, Pat Field, Alan Gibbs and Ray Reese from Australia, watching the presentation. For a small branch, William 1749 was well represented. 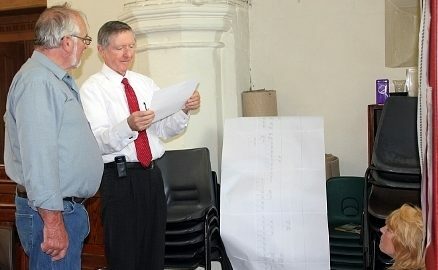 Here are Peter and Viv Rolfe, examining the printout. 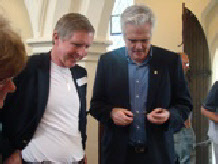 Alan Manning and I, swap stories. 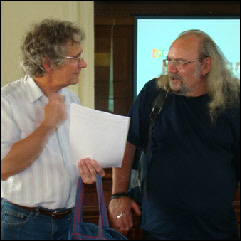 He was keen to take with him Lawrence’s presentation so that his family could be reminded of their fabulous day in Stanbridge. In the picture above is the Joseph 1737 branch of the tree. At the last Meet in 2006 the whole tree fitted here, a testament to the hard work of all its contributors. The First Meet of 2006 was a hard act to follow: this, the Second Meet of 2008 will be even harder. The day, for me, began at 6.45 with the arrival – on time – of a taxi to take me to the station. The clouds were low, dark and threatening and, sure enough, by the time I boarded the train, it was raining quite heavily. But no amount of rain was going to dampen my spirits: too much planning, so many e-mails flying back and forth and so much anticipation were not going to be spoiled by a few drops of rain! By Milton Keynes it had almost stopped and blue skies appeared to the East: Leighton Buzzard saw the first sunshine of the day and by the time I arrived at Stanbridge, the weather looked very promising indeed. 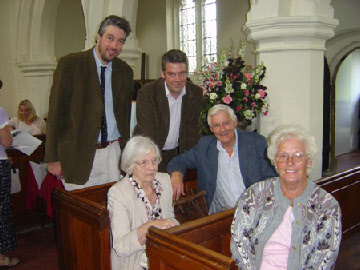 Ewart, Elaine, Barbara and Laurence – the Churchwarden – were already there when I entered the Church of St John at around 9-15. I thought my early arrival might enable me to contribute something to the preparation of the event: not so – it had already been done! Barbara was acting as hostess and I signed a Visitor’s Book that Ewart had provided – evidence of a lesson learned from last time. I was also able to place my lunch order as copies of the menu were available. Another excellent idea. Please don’t ask me in which order people arrived: the Visitor’s Book would only prove my memory to be a lie, but I recall that Pat and John Field were there early as were Ray and Denise Reese with Alan and Helen Manning and daughter Susan. At this point I began to realise the importance of the event: Ray’s party were from Australia having timed their holiday, I believe, to enable them to attend! And when Charlotte from Ottawa and Sheila (also from the Southern Hemisphere) arrived I knew we had something special. Steadily, more and more people arrived – Jo, Ingrid, Tracy, Joan, Alan Gibbs, David, Paul and others. I had brought along some of my Godfrey memorabilia as well as The Bottle which caused both amusement and interest from those who had not seen it before. There, I thought, it exists! 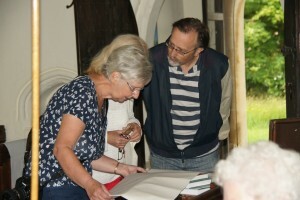 Barbara had brought along a folder containing descriptions and many prints of Thomas Tearle the silversmith’s work. A beautiful catalogue which drew admiration from so many. Ewart, of course, had done so much. 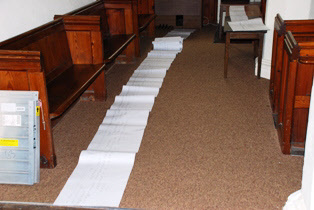 Prints of the layout of the Churchyard, envelopes for the afternoon’s project, flyers containing all of our website addresses and the provision of a scanner/copier – no stone was left unturned. The Trees were laid out on pews, but two of them had to be laid out on the floor as they were too big. Mid morning, and Laurence began his slideshow of Old Stanbridge. By this time, the sun was shining brightly and warmly and most of us were equipped with coffee or tea (supplied by Ewart) and Elaine’s delicious melt-in-the-mouth shortbread. 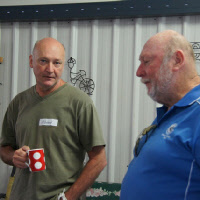 Thanks, too, to John Field for facilitating that morning tea. Thanks, here, to Laurence for a most interesting display and commentary on village life. 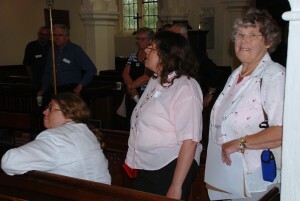 More people arrived, including Jennie Pugh, our star guest from 2006. Despite recovering from a recent, minor, operation, Jennie was delightful and very definitely ‘on form’. 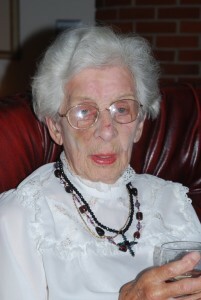 Although 93, she has promised to be at the next Meet! Now, here’s a story for you. On Thursday night I received an e-mail from Christine who had been sent a clipping from the LB Observer advertising the event: she outlined her connection and hoped to be there. On Friday night, I received another e-mail from Joan saying she and Jenny Fellowes would be attending and reiterated her connection through the Soulbury line. So, there was Joan and Jenny and their cousin Christine who had not seen each other for 40 years! Ian, his uncle David, cousin Stephen and their respective families arrived and were immediately enthusiastically studying the various trees, tying up what they had with what we had. This was good stuff – it is what it is all about! Incredibly swiftly, lunch time arrived, but not before we were visited by the Rev Janet Spicer who commented, (somewhat ruefully?) that ‘she had a congregation’. We were able to fulfil our promise that ’50 for lunch’ had been promised to the 5 Bells – exactly 50 it was, according to a swift head count. We were looked after by the staff there and despite a couple of hiccups (not being caused by the food, I should add! ), all went well. 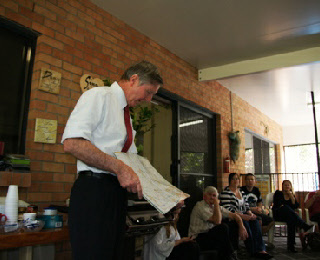 Ewart gave a short speech and an explanation of his plans for the afternoon. It must be said that Ewart played down his role, both for the day and his maintenance of The Tree: Barbara quite rightly, stood up and thanked him and reminded us all of the tremendous amount of work he puts in to that ‘maintenance’ and the huge debt of gratitude that we all owe him. Hear, hear. After lunch, I sat in the garden for a while, bathed by warm sunshine talking to David. David’s nephew Ian seems to be the prime mover in the research side for that branch, but all of that family have a great interest. David, it turned out, is the brother of Alf Tearle, who was mentioned in despatches during WWII. Another heart-warming moment. Timetables and schedules precluded me from taking part in the activities Ewart had planned and, following some long goodbyes, Elaine kindly took me to LB station and I began a long and wearying journey home – but that’s another story!! To close, I would like to apologise to anyone I have missed in the above, or have written incorrect details about. Above all, I must once again express my deepest gratitude to Ewart, Elaine, Barbara, Pat and Laurence and everyone who freely gave their time and support whether or not they were able to attend. Finally, to all who did attend, but – and I trust you will understand – especially to our overseas visitors who not only came but also must have brought their native sunshine with them!!! Since the Tearle family is a world-wide one, it is always an exciting event when we can arrange for a group of us to meet as a family, and for no other reason than that we are a family and have the desire to see each other. 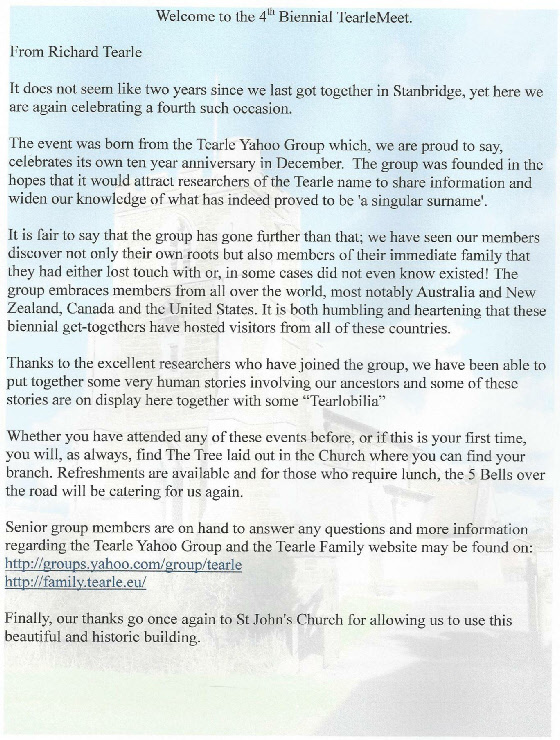 So it’s always nice to receive an invitation to meet others anywhere in the world where Tearles can congregate. Elaine and I received just such an invitation to meet a remarkable and well-knit group at the home of Doug and Deborah Tearle in Brisbane. Ray Reese had proposed a Meet in Brisbane when he heard that Elaine and I were going there on holiday after a visit to our home town of Hamilton in New Zealand. “Deb is a wonder of organisation and energy,” he said. Deborah had written to us and invited everyone to her place. Each person would bring a plate and, like the story of the loaves and fishes, we would eat as at a feast. I sent her a half a dozen pages of a chart for this family and Deb would add some mementos of her own to the exhibition on her table. We spent the late afternoon of our first day in Brisbane walking and photographing the central city, and we found a beautiful and well-kept city; compact, confident, wealthy and modern. Glass high-rise buildings jostled for space with much older colonial block buildings, many of which were under repair by a progressive and caring civic community. The city centre was aligned with the river which was followed by aerial highways and criss-crossed by at least a dozen bridges. A university and a huge museum and art gallery give intellectual gravity to a charming coastal city. The remnants of the Exhibition of Australia crowded the opposite shore with a giant ferris wheel and a landing for a water-borne taxi service. A long blue catamaran raced from wharf to wharf in pursuit of customers. 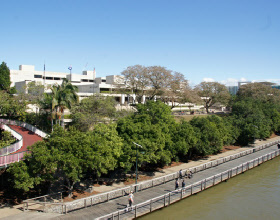 Across the river from downtown Brisbane. 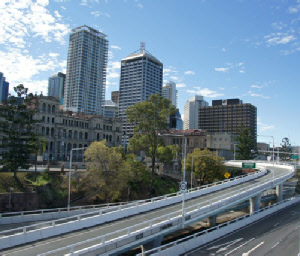 Doug picked us up from our hotel in central Brisbane and drove us on a circuitous sightseeing drive through the Brisbane suburbs to Wynnum, because I had never been to Brisbane before and although Elaine had been there twice, she hadn’t been able to see very much of it. 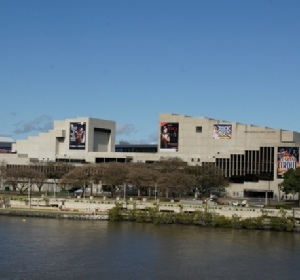 He drove past bays and beaches and showed us where the Brisbane Tearles had worked and lived; a modernist bridge arched like a skeletal hill over the river with toll booths lined up like teeth across its approaches. A tour of the attendeesFred Tearle and Lyndal greeted us as we pulled into the driveway, and Richard Tearle came out of the house to see us as well. The transom of an aluminium power boat peeked shyly from behind the garage door. The interior of the house was light, airy and pleasantly welcoming. The floor was laid with marble tiles to keep the house cool in the hottest days of summer. Deb saw me admiring the tiles. “They seemed a good idea at the time,” she said, “and they do keep the house cool in summer. Trouble is, they are a bit hard on your feet and legs if you stand on them all day.” She paused, “And nothing bounces. I’ve got a lot fewer cups and glasses now than I used to have.” She busied herself, with Lyndal’s help, carrying plates and glasses out of the room and off to my left. “We stood on the bridge last night and saw it, but it was getting dark so we didn’t cross the bridge,” I said. The chart I had sent Deborah had started with George Tearle who was born in 1851 in Hockliffe, not far from Leighton Buzzard in Bedfordshire. He had married Louisa Finch in her home village of Houghton Regis, just north of Dunstable in 1877. One of their sons, born 1884 in Tebworth, was James Henry Tearle who married Edith Lydia Morgan in the lovely old Parish Church of Dunstable. Their son Frederick William Henry Tearle was born in Dunstable in 1906 and on 11 May 1912, they took the ship Shropshire from Liverpool to Australia. In spite of now being an Australian, James still volunteered for service in the Australian Army in July 1915, to fight in Europe in WW1, perhaps because of his 8 years in the militia reserve in Dunstable, which he had joined in 1903. He was enlisted in the TCC 3rd ANZAC Battalion, 13th Company. He was tiny, just 5’ 2”, with “3 bad teeth and two missing.” Harry Leslie Vernon Tearle was born in South Fitzroy, Victoria, in 1916, and Edith Ella Irene Tearle in 1919. Since this is near Melbourne, I assume the good ship Shropshire called in there on its way to Sydney. I have no record of how or why he moved to Brisbane, but he died here in 1969. Harry 1916 married Elsa Vera Gourley in Brisbane (I’m afraid I don’t know when) and they had eight children. William married Patricia Bridget Cotter in 1941 and to the best of my knowledge they had two sons. Harry also enlisted for the militia in 1935, in the First Corps of Signalers, the cable section, where he became a corporal in 1936 shortly before he was discharged. I have one last picture of this family: the 1937 Brisbane Electoral Roll, which shows James Henry and Edith with their sons Harry Leslie Vernon and Frederick William Henry all living in a house on the corner of Fagan Rd and Butterfield Rd. and perhaps Edward and Michael from Frederick William & Bridget. Deborah had organised everyone to bring a plate of their own favourite food, and in the spirit of the generous Australians that they most certainly are, I think everyone had brought at least two dishes. In the end lunch was both delicious and bountiful. For a community that had only just overcome the worst of the most terrible flooding one could possibly imagine, this wonderful family had hearts as big as their continent. As soon as lunch was over I gave the Meet a short introduction to the story of the Tearle family, from their roots in Tearle Valley in rural Bedfordshire to our present spread through most countries on Earth. Here, I am showing the group around Tearle Valley and Tearle Country. Watching are Helen, Ron, Liz & James and Teresa. 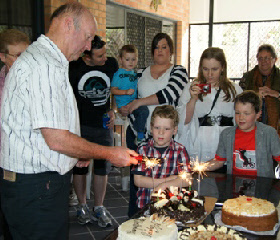 Sparklers on the cake – Doug, Ethan and Corey, James & Liz, Helen, Honorah. Ready for a chat: James, Eva, Honorah, Helen, Tlisa, Andy, Chris, Teresa & Carl Vogelsang, Denice Reese and Ron Tearle gather around the sumptuous table Deborah had prepared. Leah, Doug, Nathan and Richard. 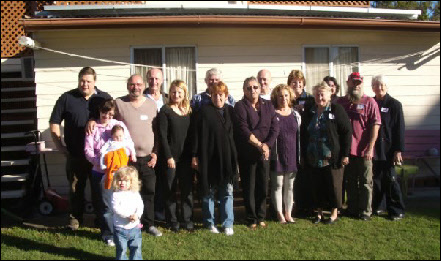 Everyone – from the front, left to right: Corey, Teresa, Ethan, Ewart, Helen, Leah, Honorah, Fred, Lyndal, Denice, David, Liz, James, baby, Noreen, Chris, Tlisi, Deborah, Diane, Ray Reese, Doug, Richard, Eva, Carl, Andy, Leonie, Nathan, Ron. Thank you for a wonderful occasion! RSVPs for this event are coming in and just over 30 people have indicated their attendance. (I don’t think that includes Ewart and Elaine our special guests). Some long lost “cousins” have been found, I am told. For those who are still wondering if they will attend. 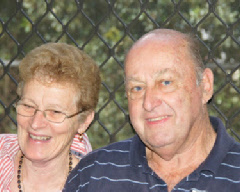 It is at the home of Douglas and Deborah Tearle at Wynnum, Brisbane at lunchtime on Sunday 28th August. Deborah as usual is doing a great job as organiser and has been contacting people with suggestions as to what to bring as we are self-catering. Have a marvellous time! I was in Tearle valley today, visiting Whipsnade Zoo with my daughter and granddaughter. It was, and still is, rich agricultural land. What a wonderful time we had at the Brisbane meet on Sunday. I did not count how many were there but I am sure we must have numbered about thirty. Our thanks to Deborah and Douglas Tearle for hosting us and to everyone for their contribution to the most delicious and filling lunch. I know it was a real pleasure for Denice (nee Tearle) and I to meet with Ewart and Elaine once again and I am sure everyone else really enjoyed their visit. 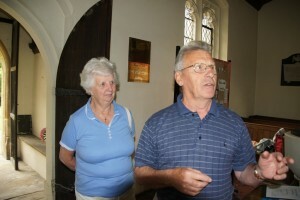 Ewart gave a talk, ably assisted by Elaine, and amazed everyone with his knowledge and enthusiasm for things “Tearle”. We remembered the last Brisbane Meet when Richard visited us from England and thought about others whose apologies were sent for this occasion. I just wanted to second Ray’s thoughts. 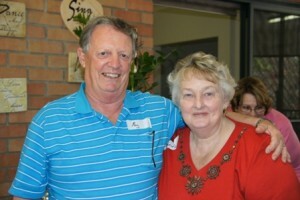 It was just wonderful to meet Ewart and Elaine and to catch up with the QLD Tearles once again! I hope that one day my family and I can make it to one of the Tearle Meets in England sometime in the future! We were delighted to welcome the grand-daughter of Henry James 1880 and Louisa nee Lees, Anne Tearle. Many of us have spent a great deal of time on the story of this family, spanning as it does two continents and two World Wars. It was a pleasure to meet her and to help show her where the pieces of the story are laid out in our documentation. By Ewart Tearle, photos by Elaine Tearle. Another outstanding success, TearleMeet3 lived up to all my expectations and wishes for the day. It was a success primarily or the hard work done by Barbara and Elaine on the door, and from Pat and John who tirelessly offered refreshments for all the visitors. We can also thank Elaine for her most beautiful cookies. Richard was on top form, too, helping people to navigate their way around the various branches spread over the floor, and renewing old friendships. Dinner at the 5 Bells was also a lovely occasion, of which more later, but we can assure everyone that the food was delicious, hot and on time. Alan Gibbs and I laid out the branches of the Tree in various aisles and draped them across pews when the aisles became full. 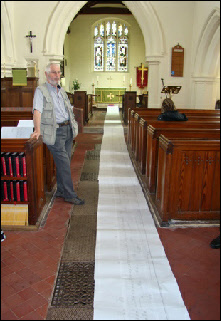 The longest branch is now that of John 1741 and it is 66 A4 pages wide and three pages deep. We also set up the projector we had borrowed from the vicarage. People came from great distances, and that is always a humbling thought; we set up an event such as this, but it is the interest of our wide-spread family, and their willingness to make the journey to see us, that makes all the work worthwhile. It is also not possible to make the Tree grow, to be accurate and comprehensive as we all want it to be, without the tireless and ceaseless work of Richard, Barbara, Pat Field and Rosemary. It is a joy and a privilege to work with you. Goff Tearle of Loughborough University has been corresponding with us for several years and he took great interest in the John 1741 branch to see where his family lay. Alan Gibbs joined him because he, too is on that branch; one of the Wing Tearles. 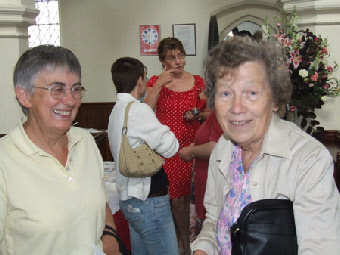 We welcomed back Enid Horton and her daughter Lorinda from Rugby, who have attended all the Meets and are famous for their work for us on the Banns Register in the very first Meet. 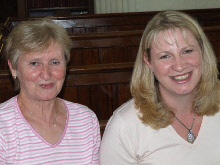 And one of our regular contributors to the forum, Jo Smith and her mother Doreen nee Gurney (a true Stanbridge girl, with an ancient Stanbridge name) gave us a few tips about the memorials around the church and how we could add to the list of Tearle memorials in our pamphlet. One of the highlights was welcoming the twin sisters of Michael and Rosemary: Maureen Rigby and Janette Harrison. They had travelled some distance to get here. I met them for the first time, and it was a happy occasion finally to meet the English family of the two people in New Zealand whom I have known for so long. Rosemary has been a huge help in many of our safaris into the stories of the families who populate the Tree. She has been an inspiration and a driving force in the group. It was very nice to be able to meet the people Michael grew up with. We were delighted to welcome the grand-daughter of Henry James 1880 and Louisa nee Lees, Anne Tearle. Many of us have spent a great deal of time on the story of this family, spanning as it does two continents and two World Wars. It was a pleasure to meet her and to help show her where the pieces of the story are laid out in our documentation. Richard Nichols originally came to find some information on Tearle men who had been in the marines, but when he met Anne, he discovered that he, too was related to Henry and Louisa, and therefore to Anne. 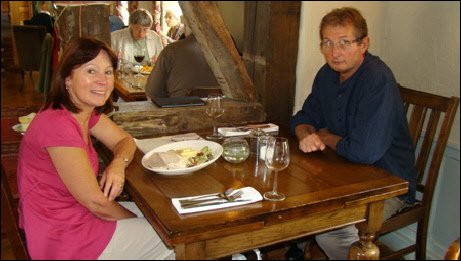 Here they are at lunch in the 5 Bells. 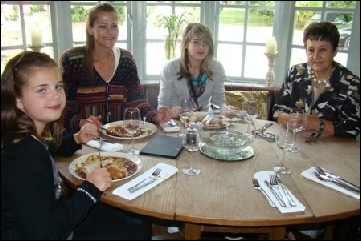 The main event was the visit from Catherine Brunton-Green, her daughter Nicola, and her grand-daughters (lucky girl) Abby and Kelci. They brought a wonderful display of photos and letters all about the Soulbury families and as the niece of Norman Tearle of Soulbury, Catherine had a special tribute for the terrible sacrifice he was forced to make in WW2, when he lost his life in the Little Ships armada off the Dunkirk beaches. 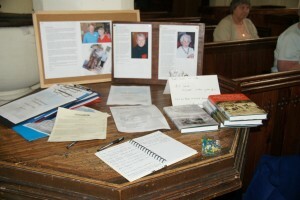 Catherine Brunton-Green and the Soulbury display. Fay and Mike Shepherd arrived looking for Mark Tearle, and that led us to Mark 1878 and Mary nee Chew. While I was finding her on the Tree, she told me she was an aunt of Oliver Mark Tearle, the author, of Loughborough University. She was fascinated that she was a Soulbury Tearle, and above you can see her talking with Nicola and Abby and examining the exhibition. 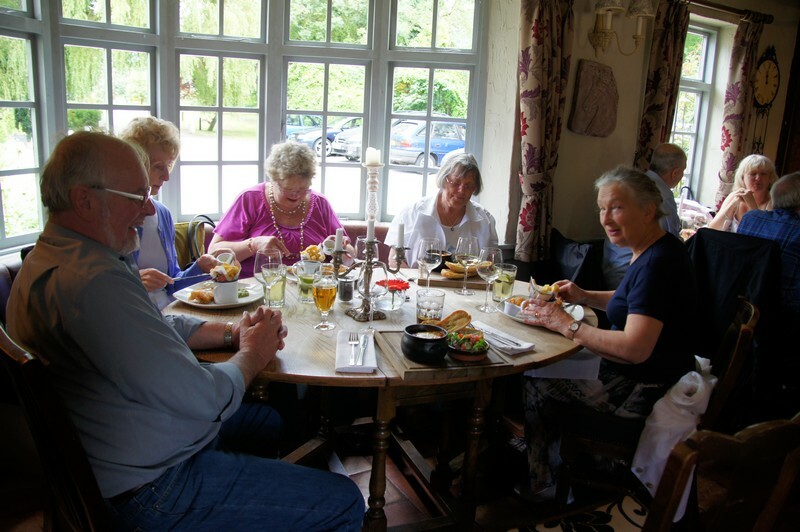 They enjoyed their lunch at the 5 Bells – and they needed to. Mike had to rush off to Spain to collect F1 cars. He is a member of the Red Bull team. Small world. I printed a 10-page family chart for Fay and she took it to investigate her newly-found family. We also had a visit from the family of Jennie Pugh; John and Grace Tearle and John’s sister Sheila Leng. We all mourned the loss of one of the sweetest ladies anyone hope to meet. 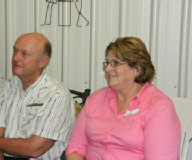 Jennie, John and Sheila have attended all the Meets so far, and it was sad to know we would never see Jennie again. We were very fortunate to welcome again the Ashleys – David and Barbara, Ingrid Taylor and her family and Pete Minns and his family. The Ashleys have attended every Meet so far and it is always so nice to see them. They are close to Rosemary and Michael’s twig on their branch of the Tree. Lis and Eleanor Minns with Ingrid Taylor, David Ashley and Greg Minns. 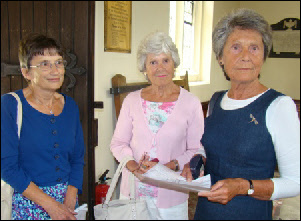 When we retired to the 5 Bells for lunch, Barbara introduced a short section of the event, which was to recognise the members of the group who had died since the previous Meet. As a family history group it is right and proper that we should pause to remember those who had contributed much but who could no longer help us in person. She spoke movingly and passionately about John L Tearle, who was the inspiration for the Tearle group, and who has supplied the basic text we all work from when we explore the origins of the Tearles in Stanbridge: “Tearle, a Bedfordshire Surname.” She noted also the passing of Mavis Gertz of Australia and the contribution she has made to our knowledge of the Tearles in Tasmania and Victoria. 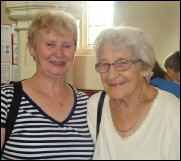 Elaine then spoke about her life with Jennie Pugh and the lovely lady to whom we had to say goodbye since the last Meet. Richard thanked everyone for their attendance and wished them all a safe return home. It’s always sad when the event is over because it is 2 years in the making and six months in the planning and we renew our friendships at the same time as meeting new members of our family. The effort some people put in to attend is quite remarkable and we thank you very much. The John 1741 branch just goes on and on. 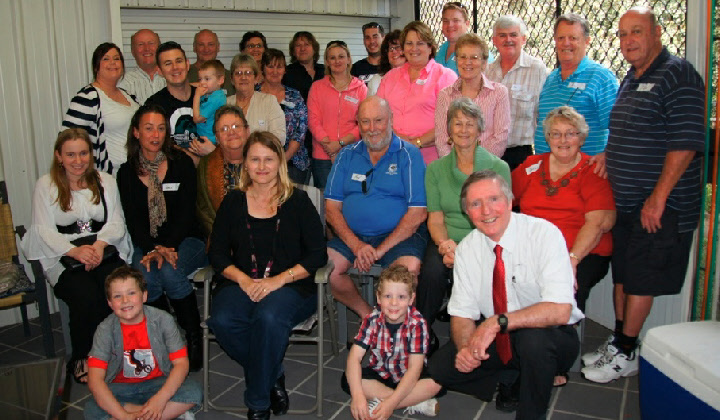 On a crisp Brisbane day of barely 30C, Richard met with the Australian Tearles in a delightful and informal function. Ray Reese, whom we all remember from the previous Meet, sent me these pictures of the day. Denice and I have great memories of the last meet and will be thinking of you as you meet this time. We would hope that everyone has an enjoyable time as we did last time. It was a great pleasure to meet you today Richard, as well as Sam and her lovely family! It was also wonderful for me to meet my Mum’s Tearle cousins for the first time too! Douglas and Deborah put up a delicious spread for us all which was very much appreciated on this chilly day in Brisbane! As you mentioned Richard, we also had the pleasure of meeting Bev Floyd. Bev’s Tearle family is somewhat of a mystery to me (as it is to her). Once again Richard, it was fantastic to meet you today and I hope that the rest of your stay is a great one! Teresa – thank you so much for those kind words: in return, you have no idea what a thrill it was for me to meet all of you – even more so now as I did not realise that you had not met your cousins! Bev did indeed do us all proud – but how could you call it chilly!!!! I knew that we had done quite a bit on Minnie and Minnie Maud and I am absolutely delighted that it has been of great use to someone (Bev) and I do hope we can find out a little more for her. 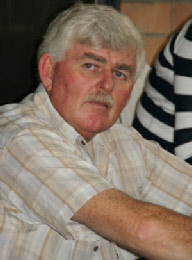 Ewart – I have some details from Bev and will show them to you on the 17th. Sadly I am unable to attend the meet this year (attending a 70th birthday party with the in-laws!). Just wanted to wish everyone a great Tearle day. I’m very sorry that I can’t make Saturday as I’m signing at a wedding in Sussex. I would love to have come and hope it goes really well. From the Moses Tearle and Amelia Cooper Cooper branch in Waitakere, west of Auckland, New Zealand. Here are the pictures of the horseshoe I was telling you about. As I said it was made for Ruth’s 7th birthday back in 1890 if my maths is correct. The ruler in the picture is placed with both metric and inch measures on it so hope you realise just how small it is. Have been in e-mail contact with Jewelly. As you rightly say it is tiny but exact in every detail, it must have taken a fair level of skill to produce. Will raise a glass next Saturday, what time is the get together? I might be in bed bearing in mind the time difference (we are seven hours ahead at the moment), but will be thinking of you all. Birthday present for Ruth Tearle 1883, dau of Levi 1850 and Sarah nee Blake. Wing, Bucks, 1890. 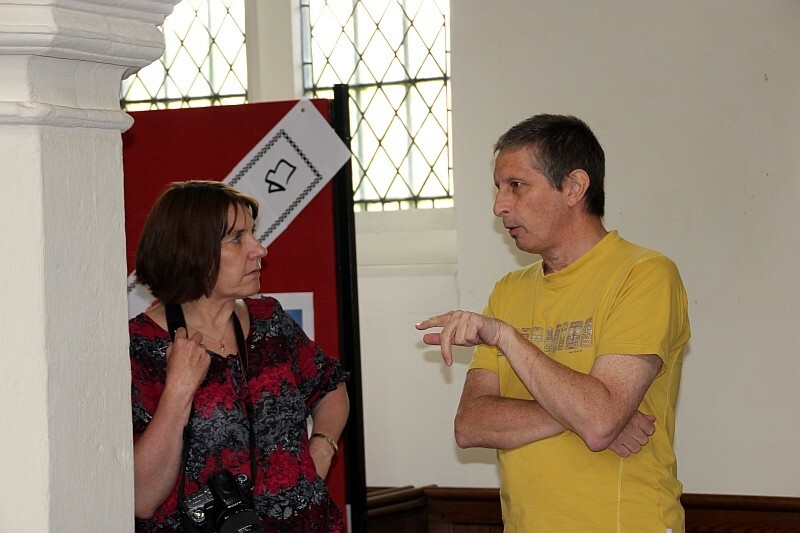 Just to echo the thanks to Ewart, Elaine, Barbara, Richard for organising another successful day – it was friendly, interesting, stimulating, respectful and emotional … I had a sore throat by evening I had spoken so much about the Soulbury/Luton Tearles. P.S. Elaine’s shortbread is just SO delicious!! Thanks again for the great day on Saturday, it was one of those singular moments that don’t come often enough. Not only did I meet up with some of my distant relatives and gain an insight into where the Tearle family originated but also by chance had dinner with whom I found out was a much closer relation, Anne Tearle, coming from James (out of William – Stanbridge 1749). Anne and my mother share the same Gt Grandfather! As it was only on the spur of the moment that she decided to attend I feel particularly lucky! Just wanted to add my congratulations to Elaine and Ewart for organising the 2010 TearleMeet. success of the research that has been carried out. I was so pleased to be able to be there this year and meet so many members of the very extended family. Dear Ewart and Elaine, just a note to say how much we enjoyed, attending the “Tearlemeet”. You must put so much hard work into it all; aren’t we lucky to have two people working so tirelessly to get a family together. We really did enjoy it, and were amazed at the amount of research you must have done to have produced so much information! Norman will be sending you some of the photos’ he took which he’s quite pleased with; they really do seem to capture the atmosphere. Thank you both very much again from the four of us; we look forward to seeing you again in two years time. Very best wishes from us all, Maureen, Norman,Jan., and Roy. Firstly THANKS to you both for all that you have (yet again!) done towards the Meet. It just wouldn’t happen without you two. Hopefully the people who come and those like us who stay at home because we aren’t near-by make it all worthwhile. 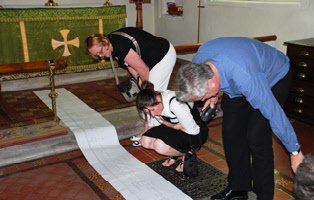 Since the last meet the trees have grown so big that two of them could not be fully unrolled along the length of the nave – that shows how much work everyone has put into reconstructing our families since the last meet and how much Ewart has done in recording the research. Jennie Pugh who attended the last two meets and who was a living link with the Wing Tearles from the late 19C. Thank you, Barbara: I can only echo that except to add that you have done more than ‘your bit’ in making both the group and the Meets so successful.. I would also like to add my thanks to all who made it and gave us even more information, Catherine for her superb display of the Soulbury Tearles and new member Anne who only joined 2 days ago. Richard Tearle, leader of the Yahoo Tearle Group. The weather broke kindly for us, but only after an indifferent start; a light drizzle for much of the early morning but the grey clouds soon rolled away and we had bright and quite warm sunshine for the majority of the time. In terms of numbers attending, this was the lowest turn out, but we knew that it might be more difficult for many people this time around. Having said that, the people who attended had a wonderful time and there were some very important and interesting stories that came out. Stanbridge Church from the graveyard. I had stayed overnight in Luton so it was an early arrival for me and a chance to take some pictures of the church and churchyard. 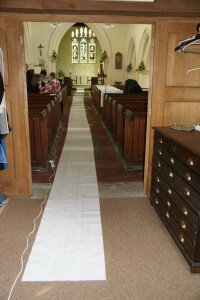 Ewart arrived just before the church was opened for us and we busied ourselves laying out the various trees, organising the visitors books and pamphlets. From vestry to altar, the branch of John 1741. 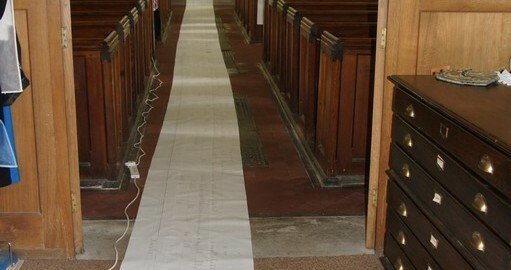 The printouts for other branches are laid over the pews. 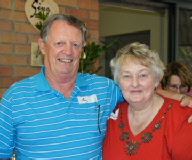 Pat Field was once again an invaluable attendee and husband John looked after the refreshments in his own special way. Elaine arrived a little later with Sheila Rodaway who had timed her holiday in England to coincide with The Meet – and wonderful it was to see her. Elaine had been showing her around Tearle Valley, especially Wing and Leighton Buzzard. The Meet gets under way. 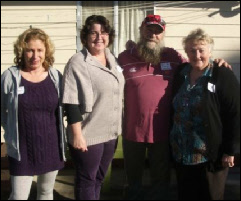 From left: Irene Fairley, Ewart, Steph Teale, and Elaine with Richard and Sue Flecknell and Sheila Rodaway. Lunch was taken as usual at the 5 Bells and I made a short welcoming speech and then passed the honours to Ewart who delivered a wonderful and very moving tribute to dear Rosemary, whose passing last year was a blow and a shock to us all. The afternoon passed at a more leisurely pace and we finally wound up the proceedings at around 4-30. One of the last people to leave was Deborah Meanley, who gave both Ewart and myself a signed copy of her book of her poems. I read them that night and they are both wonderfully witty and, in places, quite acerbic! Thanks also to Rod and Stephanie who drove down from Yorkshire just to be here – and in doing so they – and we – made a fascinating discovery connecting Teales and Tearles: it could be that Rod will have to change the spelling of his name on his fleet of breakdown vans!! All in all, then, a good day in which we were able to concentrate more on individuals rather than generally pointing people towards the right tree. My thanks to all who attended, to Ewart for all his very hard work and Elaine for her organising skills – not to mention her shortbread! About 30 people turned up for TearleMeet 4 but what we lacked in numbers, we made up for in the excitement of our discoveries. 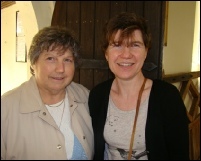 We were especially pleased to see the visit of Sheila Rodaway, who had made the journey from Canada. It was also nice to see that progress had been made on basic research since the last Meet. There was an enlarged Tearle Memorials in Stanbridge (2012 edition) pamphlet, and many of the branches of The Tree had grown considerably. The John 1741 branch, as you can see in the picture above, stretches all the way from the altar to the vestry. The Joseph 1734 branch simply did not fit in its usual place in the north transept, either, and there were also two trees that had not been on display before – Nathaniel’s Tree and Ebenezer’s Tree. We now have a tradition of honouring our passing family, and a display incorporating a poster for John L Tearle, Rosemary Tearle, and the men and one woman who died in two World Wars was placed near the window, as you can see, below. 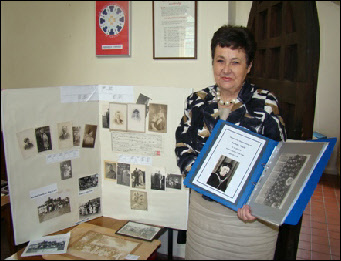 To complete the arrangements for the day, Elaine had baked a great supply of her famous cookies – shortbread slices and afghan biscuits – while John Field had volunteered to be the Canteen Manager, and Pat Field took up the Front of House position near the entrance door, ensuring that everyone who arrived was welcomed, registered, given a clipboard, documents and pen, shown the exhibits and offered a lunch order. Events such as this cannot be held without the dedicated work of a few inexhaustible volunteers, and we thank them. Richard’s inspiring welcome message, reproduced below, set the tone for the day, which was welcoming and inclusive, as is Richard himself. The churchwardens had set out the church documents for people to study: there was the marriage register, the banns register, the burials register and the complete booklet of the Bishops Transcripts of the Parish Registers, begun in 1562. The little village church from where we originate has a long and rich history, and we are proud to be amongst its children. I hope everything goes well tomorrow – pleasantly warm, not too blustery or rainy, good turnout, interesting networking, good lunch. Wishing you all a very happy day in Stanbridge on Saturday. Please accept the greetings of Denice (nee Tearle) and I for your Tearle Meet tomorrow. We have very pleasant memories of the Meet in 2008 and the fine arrangements that were made for that day. Of course, meeting the “Tearles” and seeing things Tearle in Stanbridge was extra special. Greeting also to Elaine who shared with you in Brisbane meet no 2 and to Richard who inspired the first one on the occasion of his visit. Our visit last year to your home and your guided tour of parts of Tearle Valley are also remembered with pleasure and gratitude. I am not sure when it will be but I am determined “we will be back”. Thank you. We can assure you that you were missed, and all of us here wish all of you, the very best. As part of the welcome pack, we printed Richard’s welcome message and included it with the Memorials pamphlet. So now to business. 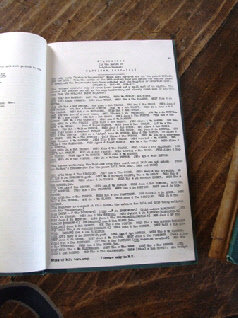 We laid out the branches of The Tree, an impressive 400-odd pages glued together in long strips about three A4 pages deep, and up to seventy-eight pages wide. Once the branches were down, visitors had to watch where they walked, lest they stepped on a branch, or someone on all fours studying a branch. The rich documentation left for us by the churchwardens, as well as the objects and documents visitors had brought us were an ongoing source of interest. 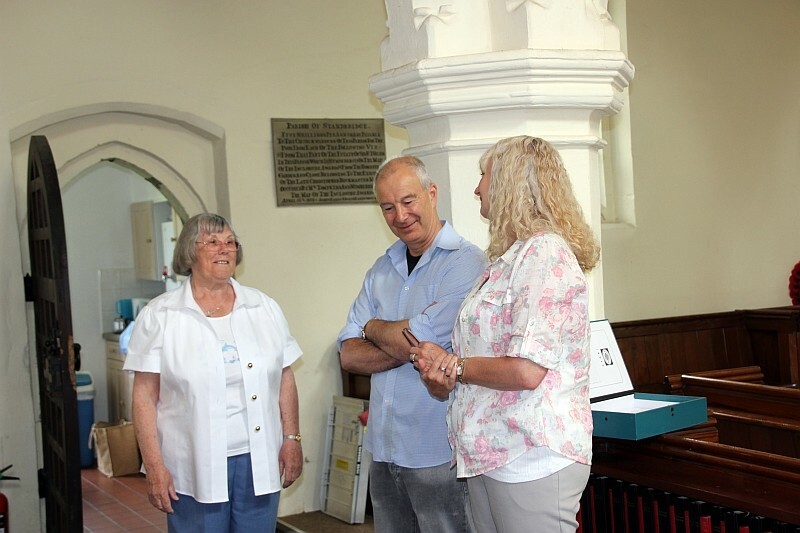 Sheila Rodaway, a cousin of John L Tearle, talks with Goff and Sharron, below. Goff’s ggg-grandfather was Thomas 1807 who married Mary Garner of Toddington. Thomas was also my ggg-grandfather. 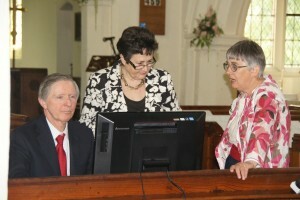 Sheila Rodaway talks with Goff and Sharron. 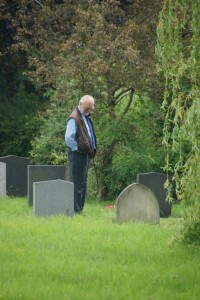 By ten o’clock, after the usual gloomy, rain-drenched start to a TearleMeet in Stanbridge, the sun was out and some had left the body of the church to explore the headstones, the Monuments pamphlet clipped to a board, pen in hand. “She was my great-great grandmother, too,” I grinned. I reached onto the registration table and took a Monuments pamphlet, clipboard and pen. “Let me show you something, and you can read out to me page nine of this pamphlet.” I led off to show them the headstone I had known about since my first visit to Stanbridge in 1997. “That’s right,” I said. “I don’t know very much about Mary’s family, I’m afraid, but I can give you answers to your first question.” We’d arrived at the headstone and James read the inscription. James Tearle and Mary. He was visibly moved. He had been closely investigating Eggington, he had been researching for years, and here was Mary’s headstone in Stanbridge, almost within sight of Eggington, and certainly a very short walk. We paused while James paid his respects. I turned to Margaret. “Now read page nine of your Monuments pamphlet.” She read it out slowly, and when she’d finished she blinked several times, trying to absorb the timeline, but smiling at the last line of Mary’s story. “Much Married Mary,” she quoted, the alliteration tripping gently from the tongue. Ewart with James and Margaret Andrews. Meeting my Andrews cousin was a highlight of the day for me, and I would have gone home very happy if that was the sum of all that happened, but there was much, much more. Elaine appeared at my shoulder while I was looking in Joseph’s branch laid out in the north transept. Elaine Tearle chats with Richard Flecknell. I had a look on Joseph’s branch; I was sure this James had married a girl called Webb. I found them – he did; in fact, he and Mary Ann nee Webb had fourteen children and James was actually Joseph and Phoebe’s grandson. Joseph would have known nothing about little James, but Phoebe would probably have bounced him on her knee. 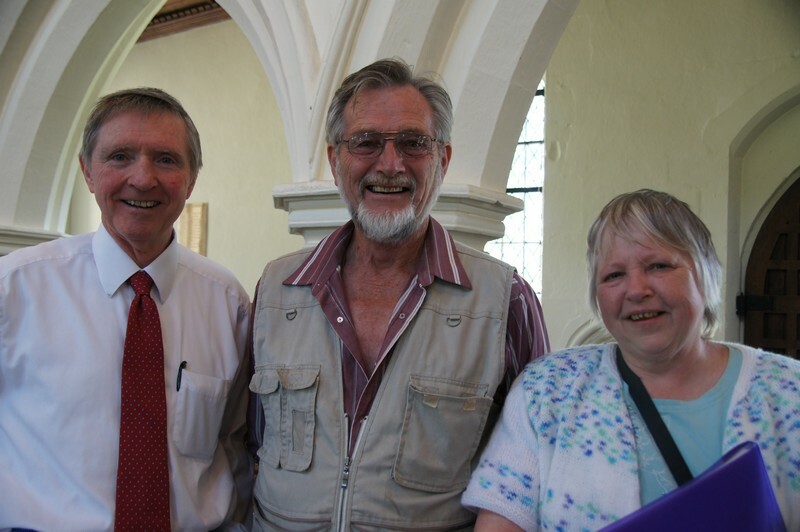 Richard Flecknell and Sue tell their story to Richard. “Oh!” she said with a start, realising the eyes of the group were now on her. Richard Tearle had just joined the group and he, too, was interested in her story. “My great-grandfather was Levi Tearle, and he was born in Thorn, near Dunstable, in 1855,” she announced. “Down Chalk Hill on the A5, turn right into a tiny lane marked Thorn and at the end there’s a cluster of farm buildings. That Thorn?” I asked. Richard cleaned his glasses while he looked at her steadily, taking in a shy, almost reticent, young woman, who seemed surprised at the interest she was generating. “Which of Levi’s children are you descended from?” he asked. “Levi married Mary Summerfield,” she said, warming to the task and incidentally showing she had researched her family well. “He was always involved in the hat making business in one way or another; either making hats or dealing in the materials that hats are made of.” Richard nodded. I had found Edward James’ grave under the trees near the road in Luton Cemetery. He had died in 1976. Sue must have known him. “Did you know he won the Silver Medal in WW1? He was wounded at Gallipoli.” I pointed to him on the chart. With some pride now at her grandfather’s achievements, Sue handed me a photo. “Teddy is the one standing on the far right,” she said. Elaine laid the photo down and took the picture for us which I am showing below. The two women centre front are cradling rifle barrels and the group are workers at the Royal Small Arms Factory in Enfield. They made Enfield Rifles, bren guns and sten guns, the EN referring to their Enfield manufacturing site. I gathered the Chambering Section worked on the bore and the rifling. Sue’s grandfather, “Teddy,” worked with considerable skill. “My grandfather,” said Sue, winding up her presentation, “was a son of William Tearle who married Hannah Pratt, and William was born in Houghton Regis in 1814 to a Richard and Mary.” She stopped. “Well done,” I said “Your Richard and Mary are also Richard’s Richard and Mary nee Pestel. You are cousins, but very safely distant cousins.” She smiled her shy and beautiful smile, her quest complete. Chambering Section RSAF 1914-18. 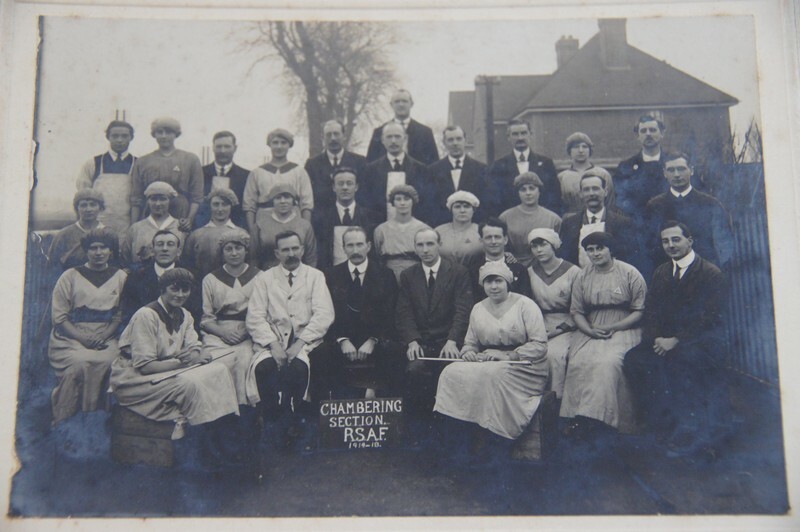 Edward (Teddy) is standing at the far right, middle row. I studied the photograph, and put Richard and Sue in the picture with Teddy. Well, that was a result. But the day wasn’t finished with us yet, in fact it was still building. “Ewart! Do you know where the Millings family is?” Pat Field was a couple of aisles away and busy showing a couple I had not yet met around the branches, draped as they were over the pews, and spread along the floor. I broke off from talking with James Andrews and thought for a moment. Rod and SheilaTeale with Pat Field and Sheila Rodway. I smiled. It’s nice to hear someone talking enthusiastically about their business. “We’ve spent the past few days in our van coming to this Meet,” he continued, “because we think – actually our daughter thinks – we are Tearles, not Teales.” He stopped for a moment to unfold a sheet of paper that turned out to be the birth certificate of a baby boy called William Teal who was delivered safely in December 1875 in a place called Windhill Idle. I couldn’t tell you where on a map Windhill was, but I knew from another family in Yorkshire that it was in the Bradford / Leeds area. Were these the Wortley, Leeds, Tearles? “We were talking with Pat earlier,” said Stephanie, “and she thinks that Jabez’s grandmother was a Millings, so that’s who we were looking for. Pat says the Millings family is somewhere in those printouts.” She waved an arm over the entire expanse of the interior of Stanbridge Church. I took a closer look at the birth certificate, the only proof they had that Charlotte might be right. William’s father was Jabez Teal and his mother was Mary Ann Teal, formerly Hallewell. Now, Hallewell definitely rang a bell. Birth certificate of William 1876, Rod Teale’s grandfather. We were standing at a small table in the centre of the church, and the Joseph 1737 branch was on the floor off to our right. Since it didn’t fit in the aisle, I had left the last few metres of the printout rolled up, as it had been in the tight confines of the boot of my car. I couldn’t accurately place the name Jabez, because there are 12 Jabez Tearles in the full Tree, but the Mary Ann Hallewell I knew was a Lancashire lass, and she had married a Jabez Tearle in Yorkshire. I walked quickly down the printout and couldn’t find Hallewell, or Millings, so I unrolled the end of Joseph’s branch and there was Mary Ann. “Here we go,” I said and Rod looked hopefully over my shoulder onto the printout; to the mass of names in tiny type organised in a wildly random pattern, joined by lines of different width which dived off in various angular directions. Stephanie stepped over the printout and looked at the names upside down, waiting for their order to be explained. “Here is Mary Ann Hallewell,” I said, pointing to her name in what had become the centre of the printout, “and here is Jabez Tearle.” I pointed to the box around his name. Born 1851 in Stanbridge, married Mary Ann Hallewell in 1891 in Calverley, Yorkshire. Occupation: 1873 in Calverley, Labourer; 1891 in Ravensthorpe, Teamer. I looked at Rod for an explanation. “The birth certificate says Jabez was a carter in a dye works,” he said, pointing to the certificate, still in his hands. “So, he’d be running horses. That’s what makes him a teamer. Perhaps because of his farming background in a rural village like this he was used to working horses, and he got himself a job with a team pulling drays. He’s working in the cotton industry, as you can see, because he’s working around a dyeing plant. At least he didn’t have to go mining,” he said with some feeling. He had inadvertently touched on the family in Wortley, Leeds. They were miners. I didn’t quite get it. I must have been looking puzzled, too. The penny dropped – this family has been in Dewsbury for more than a hundred years. I paused for a breath. A few bricks had fallen into place, but you couldn’t make a house of them, yet. I scanned the certificate on my printer, and I have presented it above. “Did you know William was in the First World War?” I asked. “Probably because the first regiment was decimated in battle, and the soldiers were transferred to another. I paused while all of this sank in. Finally he turned back to the chart. “Did you know Clement Crowther?” I asked, pointing to William’s sister’s son. “That’s the family we were trying to find with Pat,” said Stephanie. “How do you know they were Methodists?” insisted Stephanie. Everyone took a closer look at Jabez’ family. Stephanie gasped and leaned the back of her head on the wall behind her, thinking of Emma in the darkness trying desperately to save her children. Jabez had lost his eldest brother, one of his sisters, a nephew and a niece to tragedy in a place so far away, it could have been on another planet. We had exhausted almost all the information the birth certificate, and the chart, had to offer. I walked along the chart to find Joseph’s father, Jabez’ grandfather. It was William 1769, who had married Sarah Clarke. His brother was Richard 1778, who had married Mary Pestel. Richard Flecknell, Sue and Rod were cousins. This is Stanbridge – things like that happen in a village. Rod looked at Stephanie “What do we do now?” he asked. “You’ll have to change the spelling on all your recovery vehicles,” I grinned. The moment of discovery – Rod Teale is actually a Tearle. Not so much a new Tearle family, as finding one which had disappeared. Deborah Meanley contacted us to gain some details on her ancestry, that she had been unable to find by herself. She provided us with information about herself, and what she had found out about her family, and we had been able to supply her with fillings for the gaps in her family history. I added all the new information to the Tree, and Deborah said she would come to Stanbridge to see the result. It turns out she is a descendent of the Tearle and Pantling marriages in Eggington in the 19th century, and therefore she is on the John 1741 branch, the same as I am, and which Mary Andrews of Eggington had joined. Her gg-grandfather, Richard Tearle 1794 married Dianah Pantling and their son, David 1818 married Deborah Pantling. I haven’t quite unravelled the intricacies of this but I wouldn’t be surprised if Deborah was Dianah’s niece. Thereafter, her family was in Dunstable; a classic Tearle story. In the 1911 Dunstable census, Deborah Tearle nee Pantling was living with our Deborah’s grandparents, in Dunstable, along with both of the in-laws and five children, one of whom would become our Deborah’s mother. She proved much more interesting than the sober and somewhat scholarly person who had written to us. She spent much of her time in Stanbridge carefully looking through her branch of the family and noting the stories she found there. The couple of times I was able to speak with her, she was acutely aware of a lack of hearing. She generously gave Richard and I a copy of her book Mother’s Prickly Poems and autographed it for us, as well. In it are some generous and fulsome, kindly and insightful, beautifully crafted poems, along with some deliciously acidic and biting commentary on people who should know better, but who set their own standards very low, and then always failed to meet them. The advice she gives her children comes straight from the heart, and from her own hard-won experience. 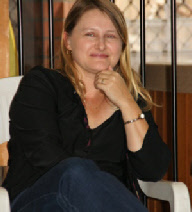 Her most beautiful and touching poem is that written on the death of her younger brother who died in 1985 in a diving accident; “Farewell to a skin diver”. Come and visit us whenever you like, Deborah. Lunch at the Five Bells. Deborah is right in her comment below; much of the Five Bells is new, but the old part, where you enter, would have been familiar to Stanbridge residents as far back as the 1600s. 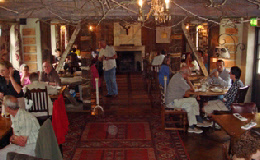 The low-hanging oak beams, the thick oak planks on the floor and the smell of English ale tell stories to each other that only they remember. It’s as much a part of the Stanbridge landscape as the church itself. 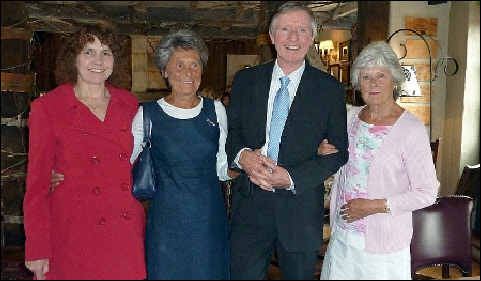 Lunch at the Five Bells: Rod Teale, Tricia Milne, Irene Fairley, Sheila Rodaway and Deborah Meanley. Behind Deborah – John Field, Goff Tearle and Sharron. For me, TearleMeet 4 was a day of high drama and satisfyingly unravelled mysteries. I enjoyed it thoroughly. A TearleMeet is not about who comes, or how many come; it is entirely about the quality of the new discoveries that only such a personally attended Meet can provide. Can I please thank Richard Tearle, Elaine, and Pat Field for the photos above, and their permission to publish them here. Can I also thank Pat, Barbara and Richard for their ongoing efforts to make the Tree as complete, as accurate and as comprehensive as it can possibly be. Without their work, the Tree simply cannot grow. Because I am a son of a country of the ANZACs, I take a special interest in the Gallipoli campaign. ANZAC Day is the most important national day on the New Zealand calendar, transcending politics. I now know of three Tearle men who fought there. 1. John Henry Tearle 1887 (9054, Royal Inniskilling Fusiliers) of Hatfield who left his mother in Bengeo, Hertford, and joined the British Army. He was killed on 29 June 1915, and is memorialised on the Helles Monument, overlooking the Dardinelle Straits. He was a son of dreadful poverty, and both his grandparents spent time in the debtors prison in Hertford. 2. Edward James Tearle 1889 (101941, Royal Engineers) son of Levi 1855 and Mary nee Summerfield, Teddy was wounded at Suvla Bay, Gallipoli, but went on to fight in Egypt and the Somme. He was invalided out of the army and awarded the Silver War Badge. 3. Arthur Walter Tearle 1880 (3063, London Regiment) who was wounded in Gallipoli, and contracted typhus. He was repatriated to Valetta Hospital in Malta, and later fought in Egypt. He also was invalided out of the army, and received the Silver War Badge. Thank you to Ewart & Elaine, Richard and Stewards for making the Day so ‘special’. Apologies for delay, due to overload with grandchild minding and House Sale complications . The whole day was enlightening and nostalgic for me as it reinforced my sense of belonging to the Hougton Regis, Harlington & Luton triangle despite no longer having elderly relatives in area since 2003. It is such a pity that there are no longer any brothers or elderly relatives to share the new findings with. 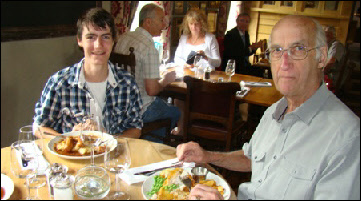 The Meal at Five Bells also had meaning – as it was probably almost unchanged since used by our ancestors? Sorry that I was unable to take new information on board quickly, due to the combination of deafness and stroke damage a few years ago. I finished off the day with a delightful five hour visit to late Aunt Audrey/Babs ‘ 93 year old friend in Harlington and had a quiet journey home – arriving there just after midnight . From one who was not there – a nice report. Pat had told me that numbers were down, which was a pity, but, as you say, it provided the time to concentrate on helping individuals and discovering more stories. I’m sure that it was a lot of work again and it is marvellous that the meet is carrying on, thanks very much to your enthusiasm and persistence, Ewart. I hear from Richard that the latest Tearle meet has been as much fun as the others, albeit a little smaller than previous ones? Richard also tells me that there was a man there who mentioned that his grandfather(?) was a James Tearle whom he could not link to the tree. Could be no connection, but my father was a James Tearle who cannot be linked to the tree either. He died in Perth in 1992. If our James Tearle cannot be discounted on that information alone, it might be worth pursuing further? Freezing here. And Auckland is in the grip of a vicious virus, and none of us have been spared! Many thanks for everything last Saturday. You both do such a wonderful job in organizing this meet. My special thanks to Elaine for driving me to/from Leighton Buzzard and a tour of Tearle Valley, it was a very special day.